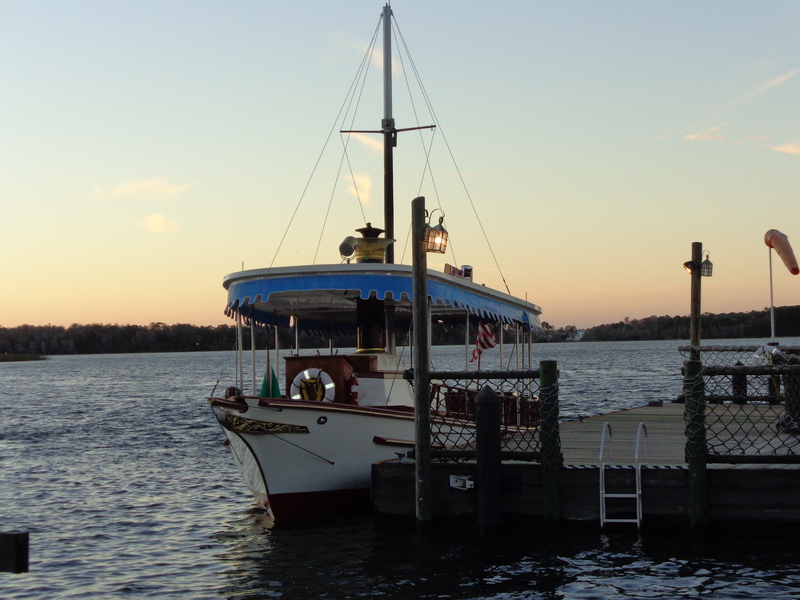 Our busy week at Disneyworld continued, as we headed to the Magic Kingdom via the ferry shuttle from Fort Wilderness. 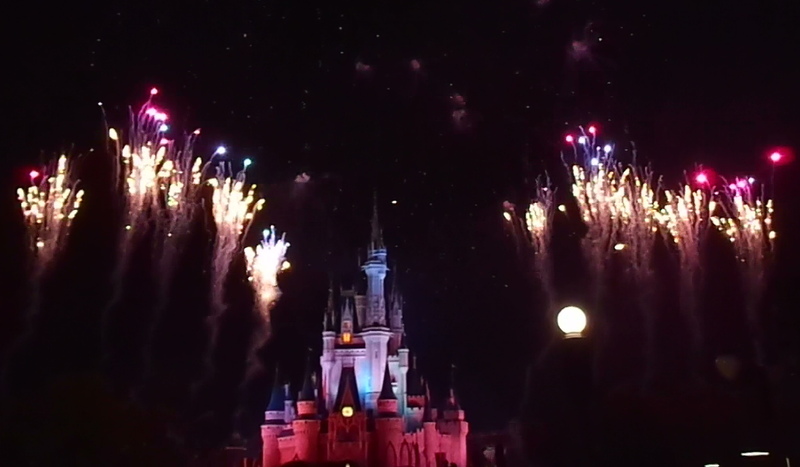 Our Fastpass rides were not until the afternoon, so we did our best to see as much as we could before meeting up with the rest of our party. 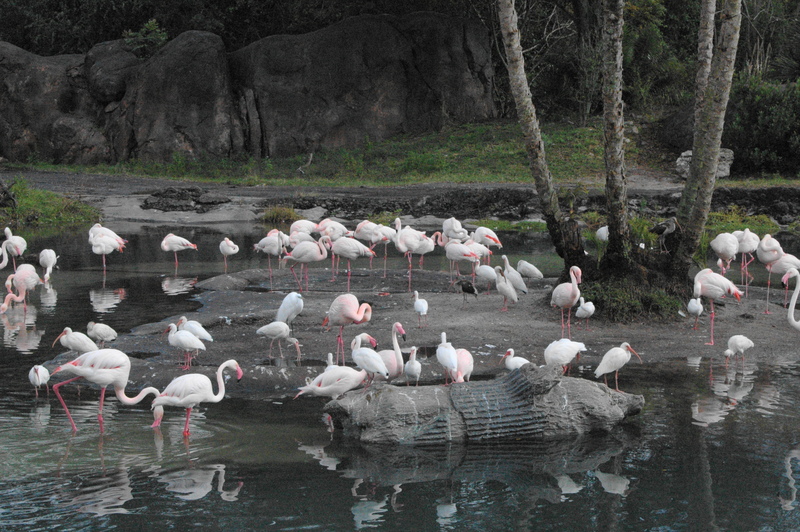 This was our first daytime visit to the park, and it certainly had a different vibe than our nighttime visit. 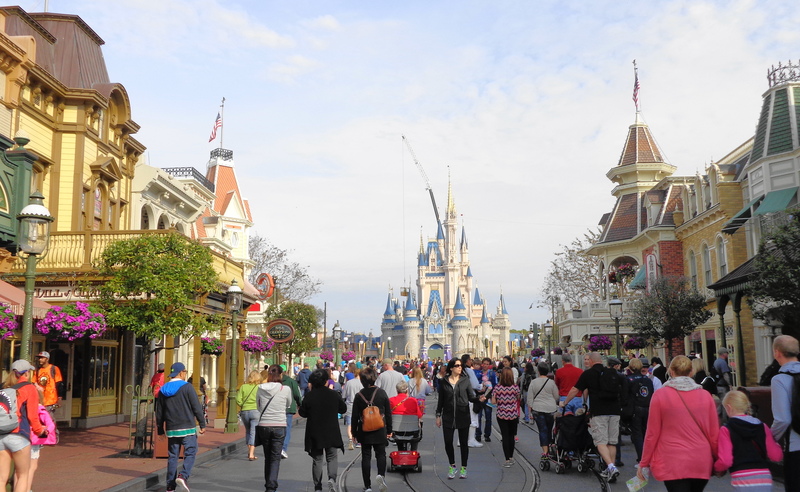 There is a lot of construction going on around the park. You can see some green walls to the left, and there is a green box in the lower middle of the picture. Apparently that box is covering up a statute of Walt Disney and Mickey Mouse. 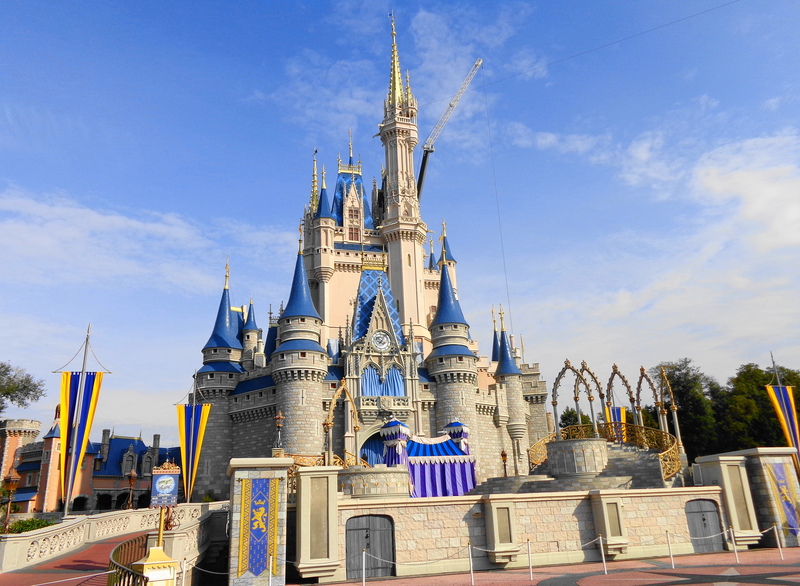 Some of the construction was recently finished, so we are looking forward to seeing the changes when we go back to the Magic Kingdom for a visit in March (trying to take advantage of our annual pass before we leave Florida!). 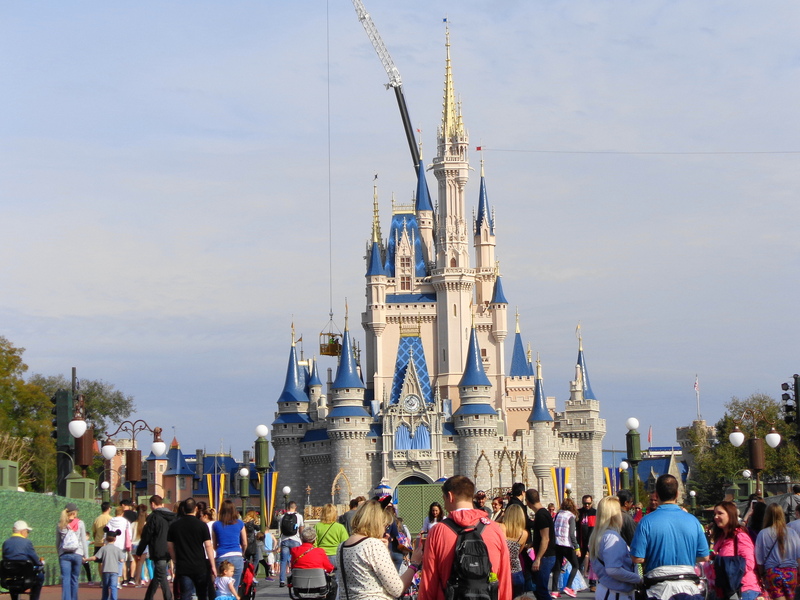 You can also see a crane behind the castle, as they were taking down their Christmas decorations and doing a few minor repairs. 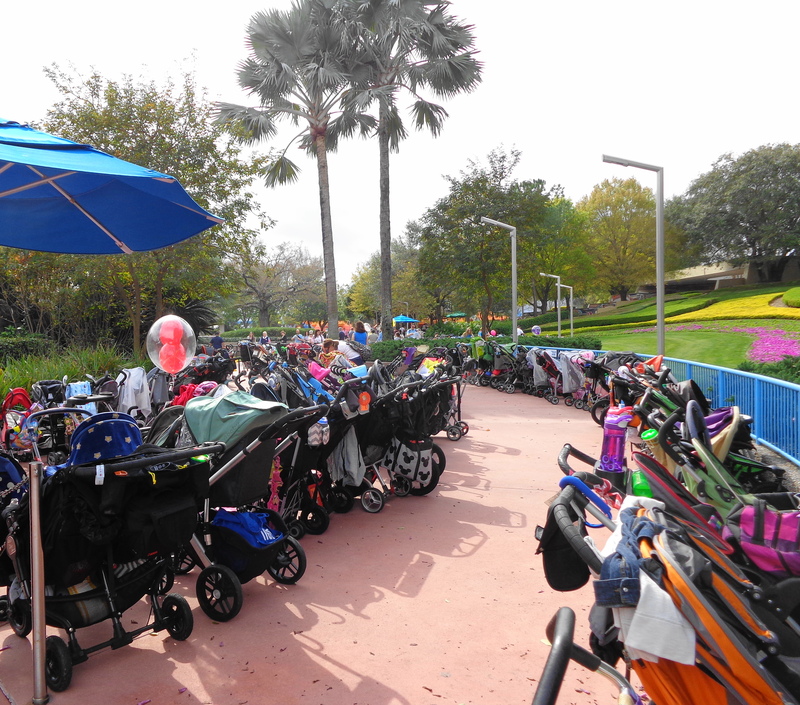 And it would not be Disney, without a huge parking area for strollers! 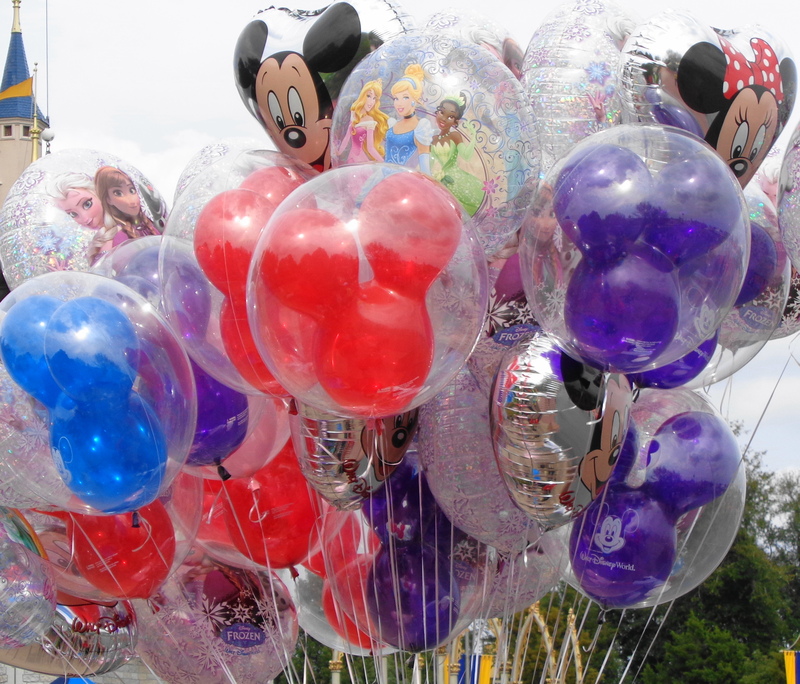 Or lots of balloons for sale! Since we had seen the 3D film Captain EO at Epcot, Al and Karen recommended we see Mickey’s PhilharMagic, which is another 3D movie to get an idea of how far 3D technology has improved since the 1980’s. We loved the movie, and recommend this for all ages. The 3D technology is impressive, and the wait time for this attraction was only 10 minutes. 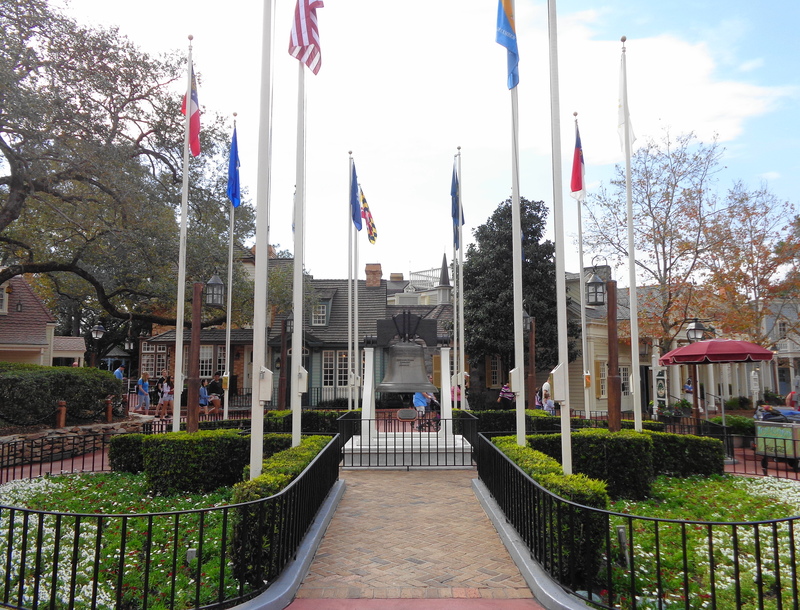 We wandered over to the Liberty Square section of the park, to view the replica of the Liberty Bell, and check out the Hall of Presidents, which contains artifacts from a number of former Presidents, as well the story of the United States, complete with Audio-Animatronic figures of every single President. 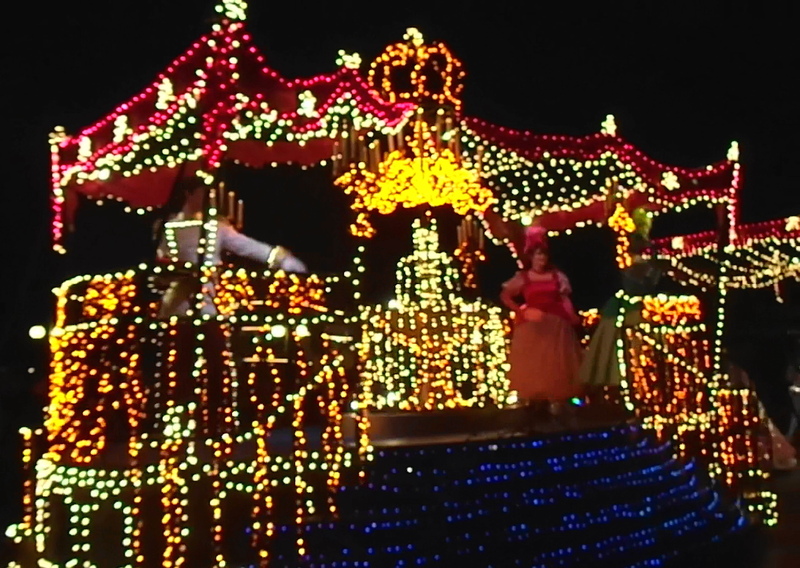 It was a very informative and impressive display of the technology that Disney perfected back in the early 1970s. 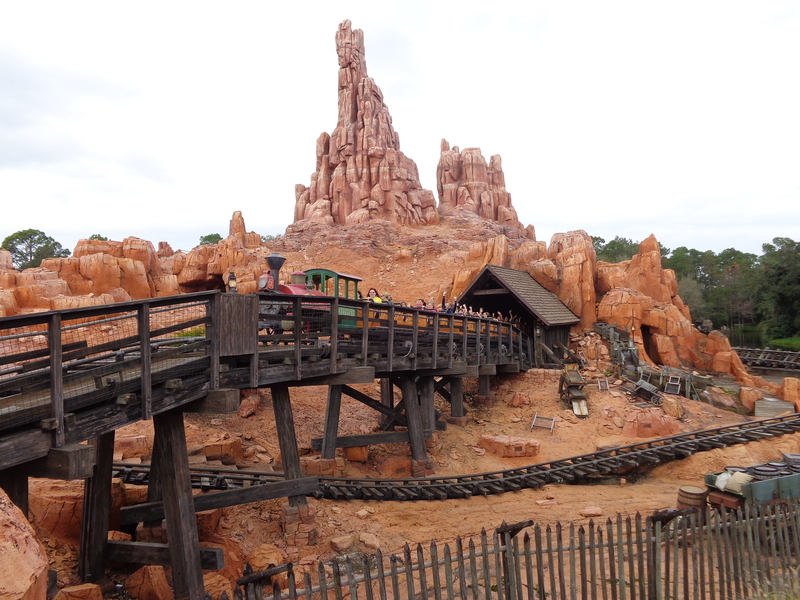 After lunch, we met up with the rest of our group, and headed over to the Big Thunder Mountain Railroad, for our first FastPass ride for the day. As far as roller-coasters go, this one is pretty mild, which made it a very enjoyable ride for me. 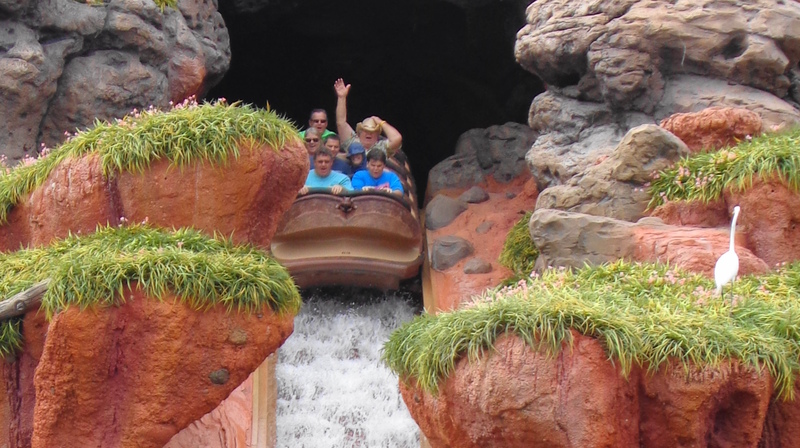 Next up was Splash Mountain, which you may want to use as one of your three FastPass options, as this can have a long stand-by waiting line. 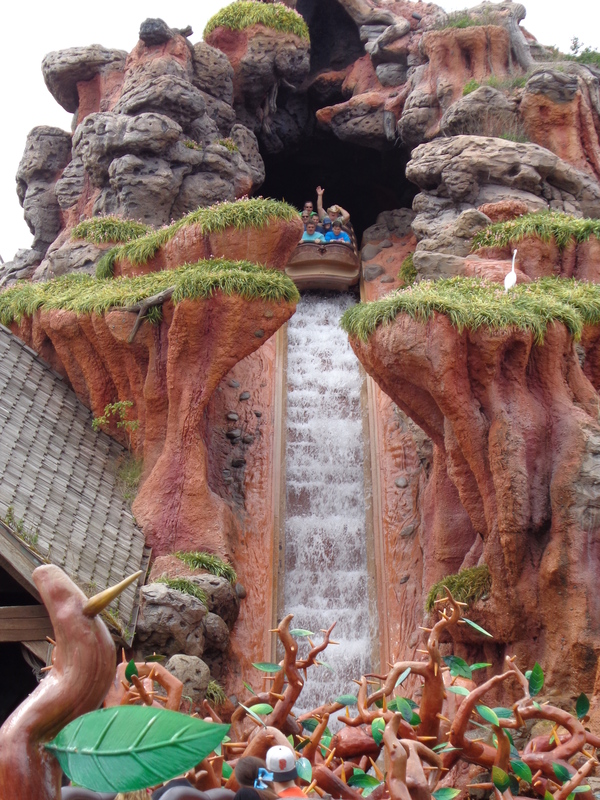 This is a log flume ride, so you will get a little wet, or in Al’s case, a lot wet! 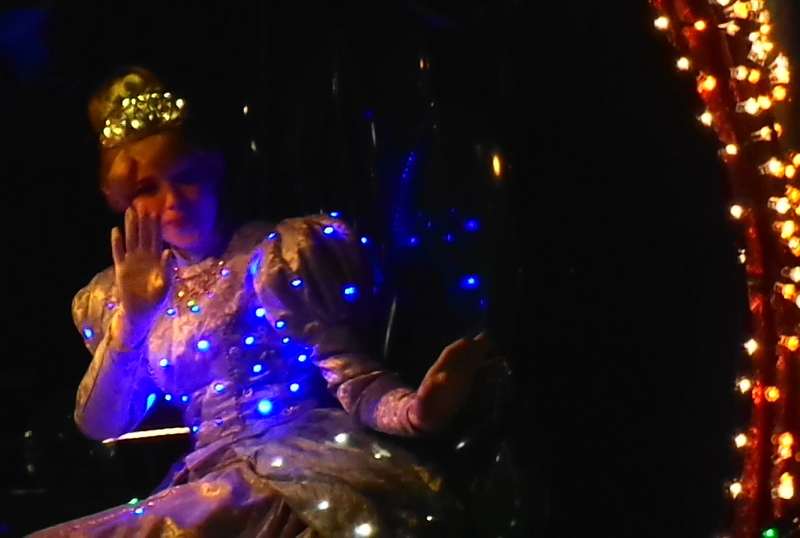 (he was in the front row of the ride!) These are some photos of our group, although not everyone went on the ride. And the young man in the front row with Al was not with us. And yes, I did put on my raincoat for the ride! If you double-click, you can see the photos better. Dan and I are in the 2nd row, I have my hood up! Fred hanging on to his hat! 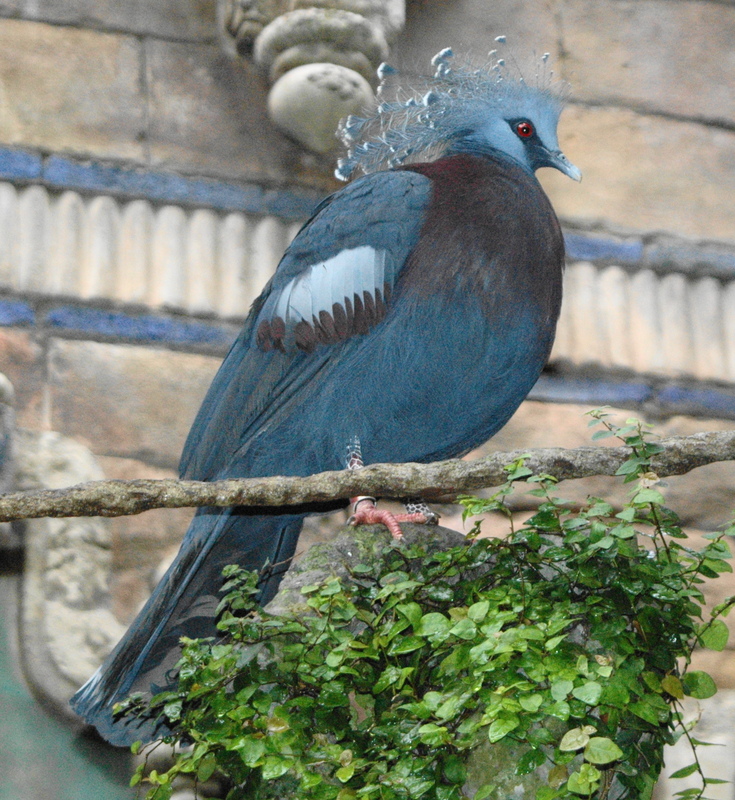 Al was pretty soaked, and Fred never lost his hat! 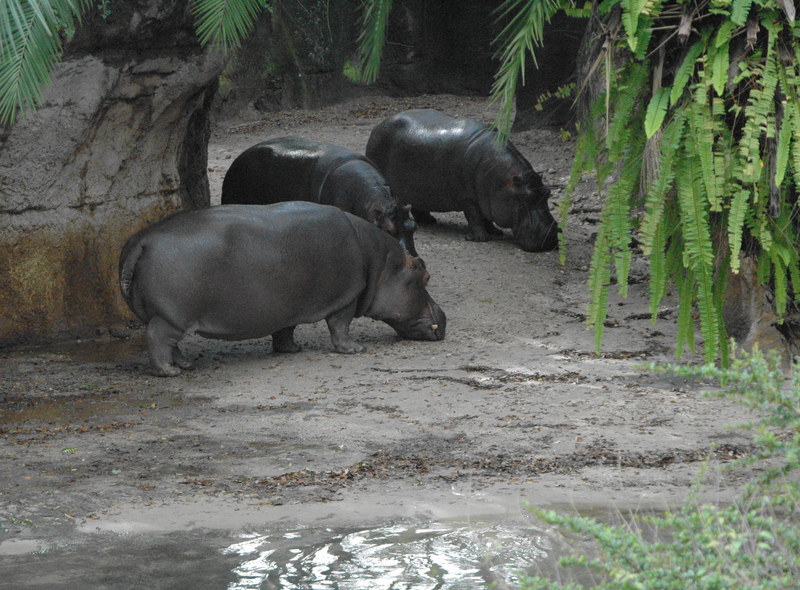 We had some time to kill before our next FastPass ride, so everyone headed out into different directions. Al, Karen, Dan and I went over to see how long the wait would be to get on the Pirates of the Caribbean ride. 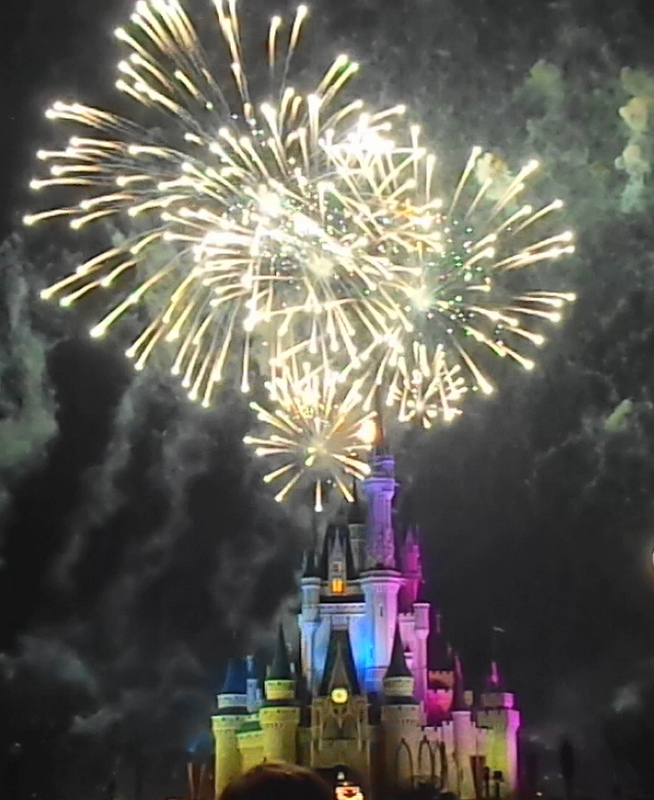 It was close to the 3:00pm daily parade, so there was not too many people in line, so we were able to see that attraction. 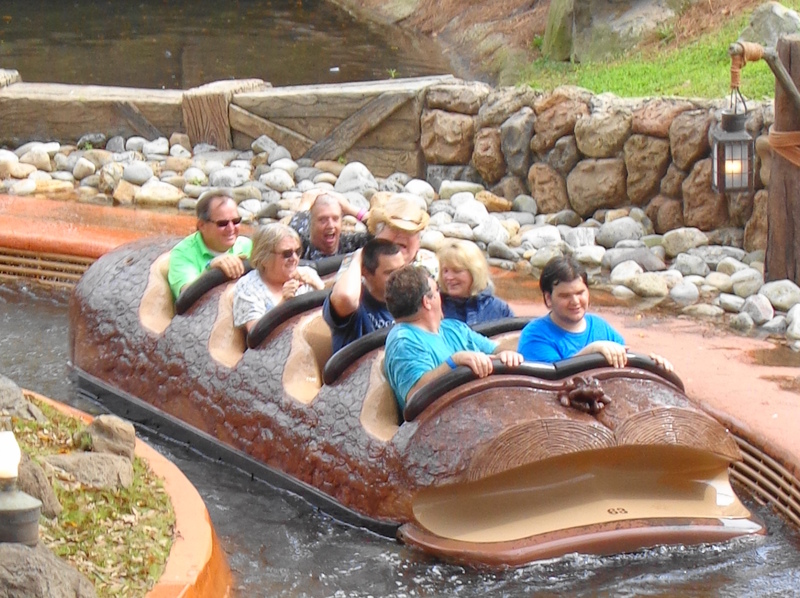 Although we didn’t notice anything wrong on our boat ride (you won’t get wet on this one), Karen and Al commented that ‘things were not working right’ and after we exited the ride, we heard the announcement that the ride would be temporarily shut-down. So we will have to go back on this in March, to see what was not working. We quickly headed over to Tomorrowlands, on the other side of the park, to go on Buzz Lightyear’s Space Ranger Spin. This is another shooting arcade game, similar to Toy Story ride at Hollywood Studios, but it is not in 3D. We thought the Toy Story ride was better. 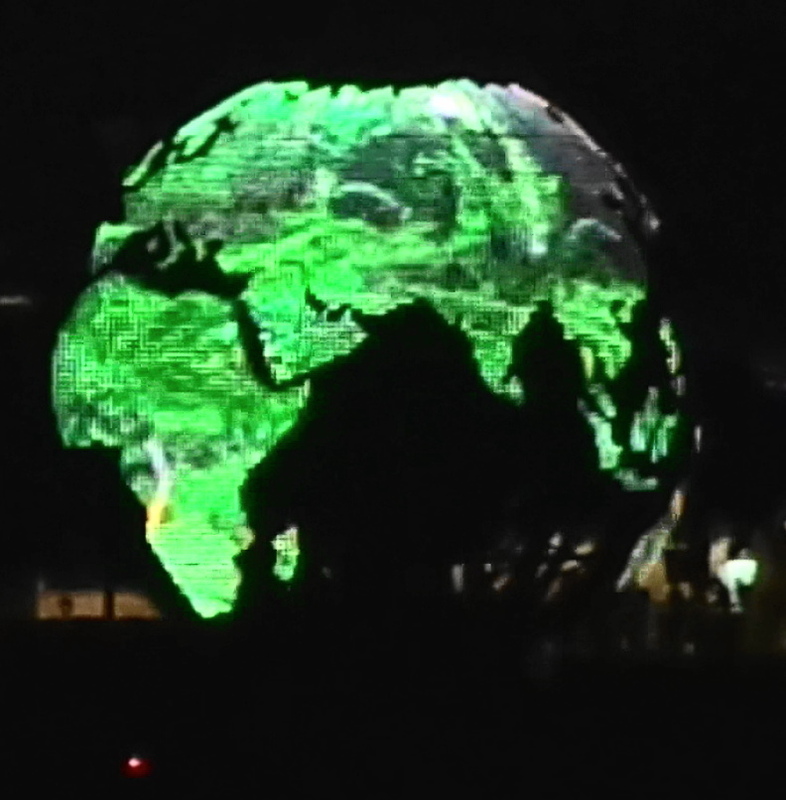 There were several other attractions in the Tomorrowlands that we plan on seeing in our future visit. 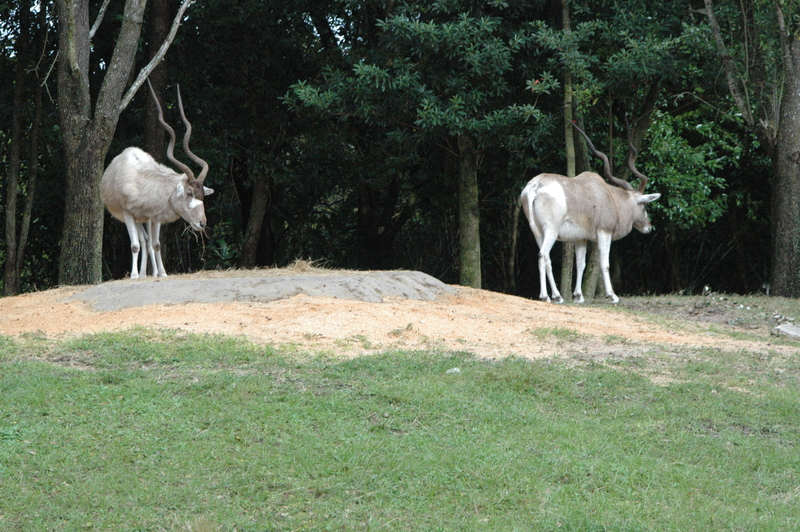 This is also the area that has Space Mountain, which is an indoor roller-coaster ride that has been around since 1975. 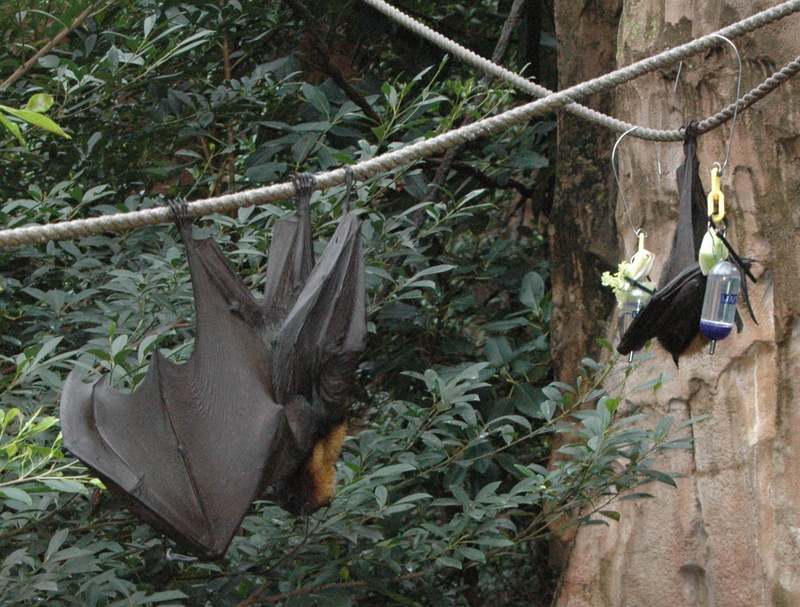 We did not go on this, and maybe will consider it for a future visit….maybe if Dan can talk me into it! 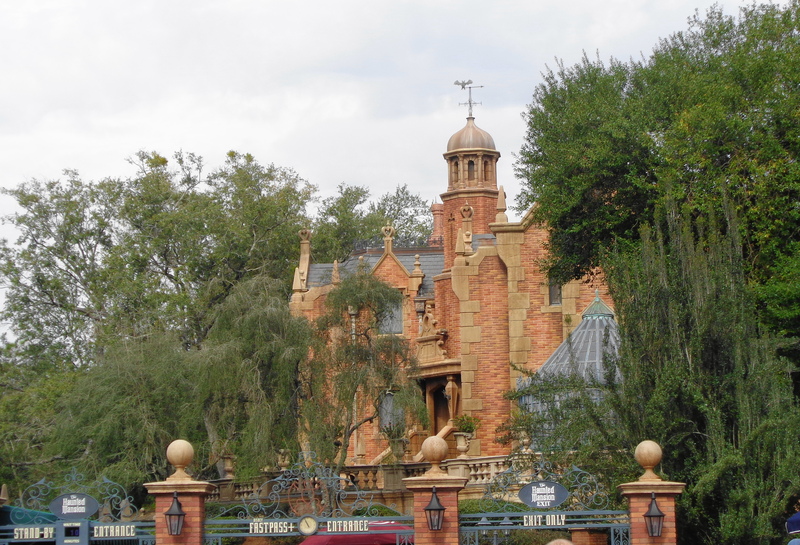 We headed back over to the Liberty Square area for our last FastPass ride for the day, the Haunted Mansion. You sit in what they call a ‘doom buggy’, and go through various rooms in the mansion. Personally, I found this boring. There was a long wait to get on this, so I am glad we didn’t have to wait in line for this. But I have no interest in going back to this ride. 180 days before our visit today, Al’s sister Ginny set her alarm for 5:00am to make reservations at Be Our Guest Restaurant at the Magic Kingdom. Apparently this is the most popular restaurant on Disney’s property, and very difficult to get into for dinner. 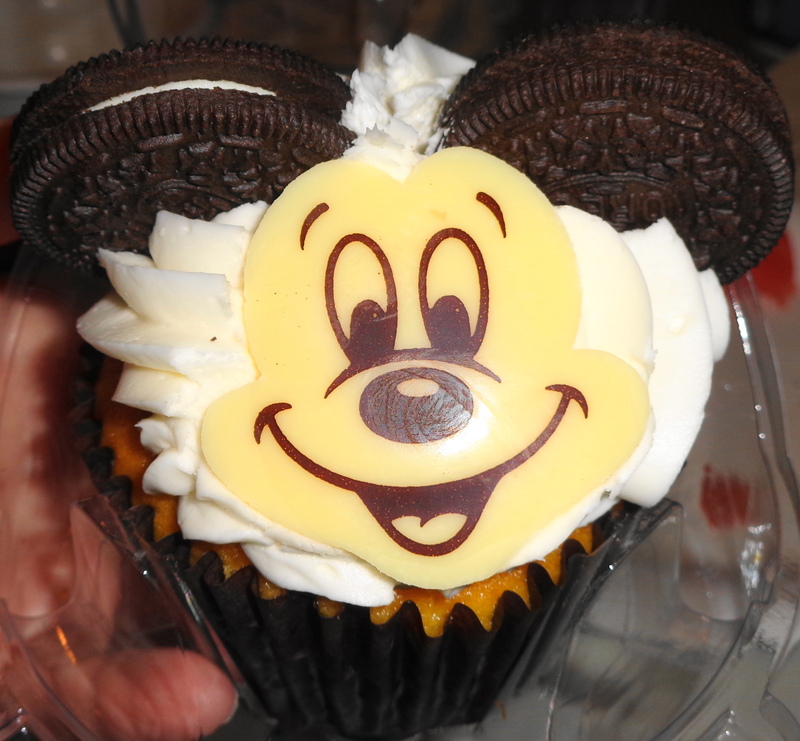 Disney allows advance dining reservations up to 180 days ahead of your visit. So thanks Ginny for doing this! In preparation for this dinner, Karen loaned us a copy of her Beauty and the Beast DVD, so we would understand the story, and the various rooms in the Beast’s Castle. If you are going to dinner here, I would recommend seeing the movie as well. It does add to the experience. 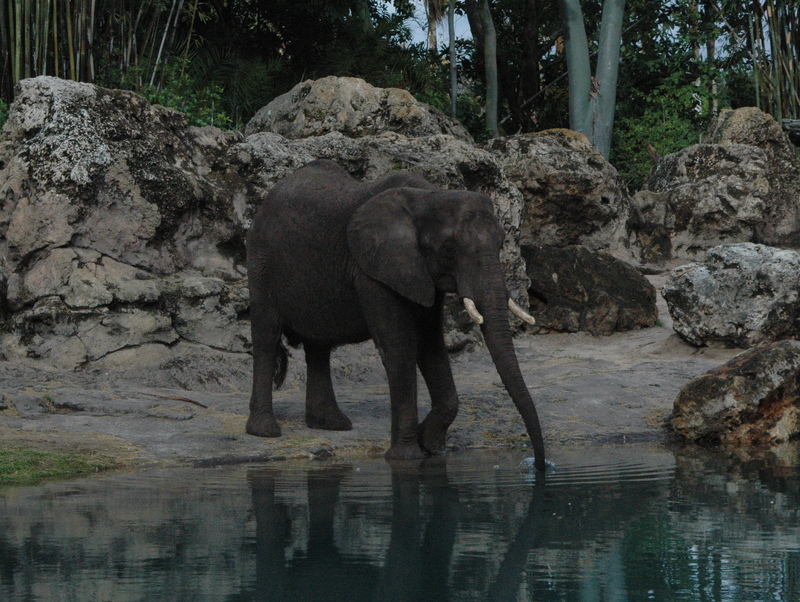 The dinner was excellent, and we appreciated the fact that Disney knows you have been in the park all day, so there is no dress code for such a formal meal. Even though the Beast was all dressed up! 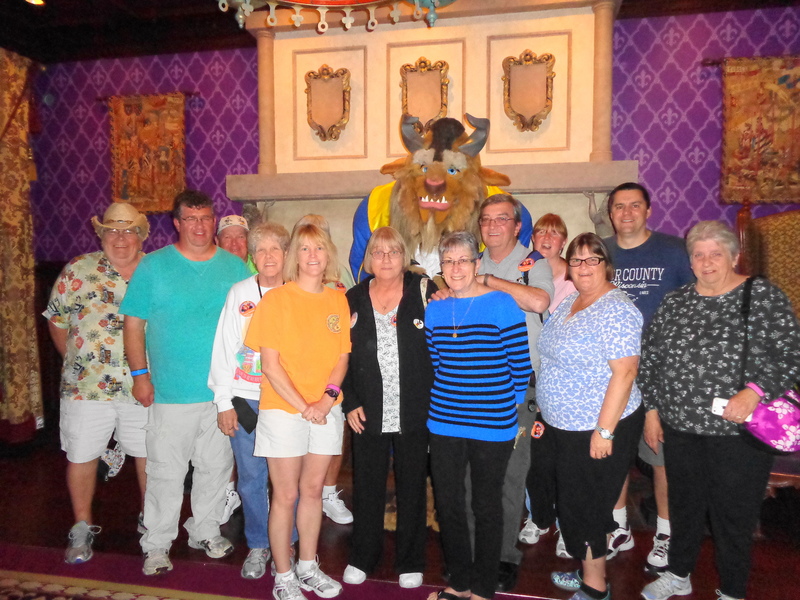 And here is our entire group: Fred, Al, Jim, Kathy, (Judy behind my head), myself, Sue, Denise, Bill, Karen, Patty, Dan and Ginny. We were happy to be ‘adopted’ into their family! After an excellent meal, with our belly’s full, we headed back to the campground to make sure Makena’s belly was also full! 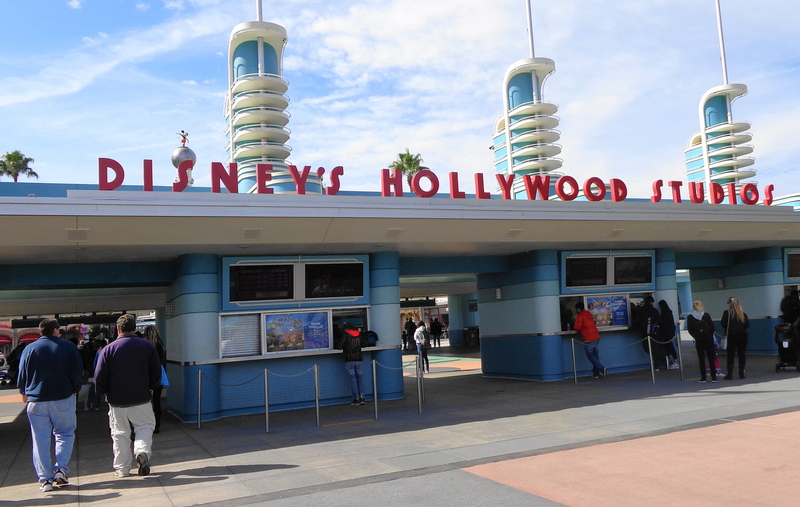 After an excellent buffet breakfast with our lucky crew of 13 at the Wave resort, we headed over for our first experience at Disney’s Hollywood Studios. 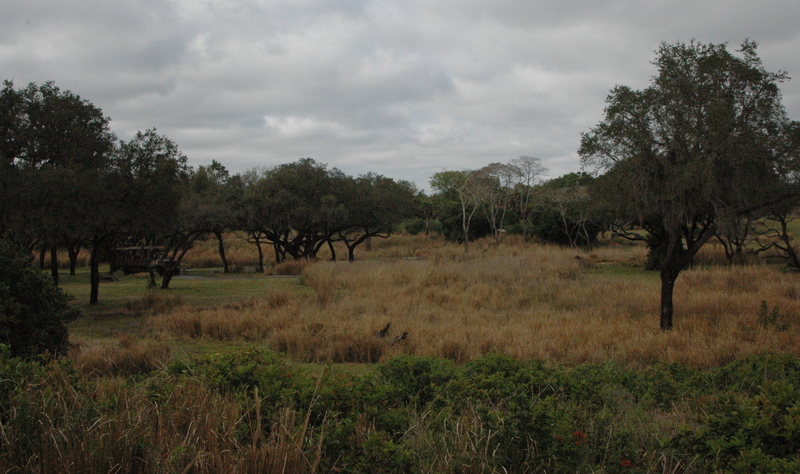 There are 8 different sections to this park, and even with our best efforts, we were not able to see everything in this park. 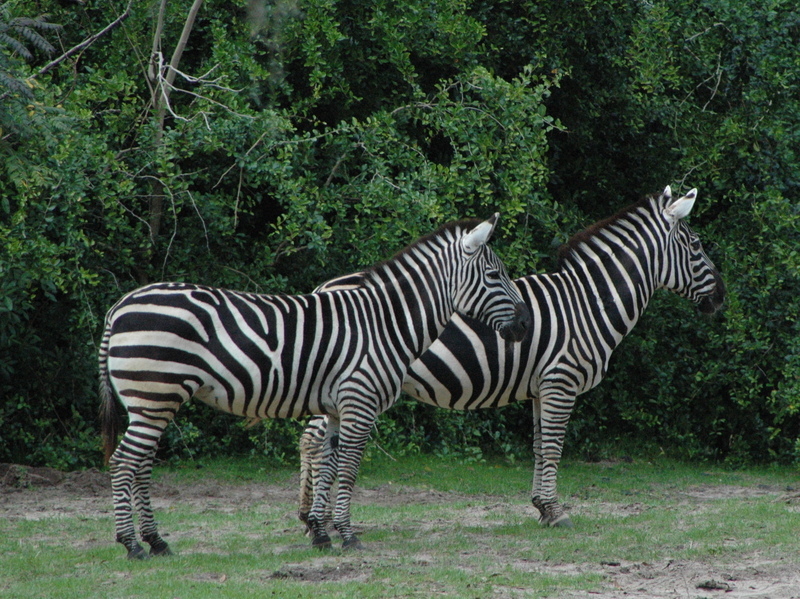 This park offers several attractions that are 20 – 40 minutes in length, making it difficult to see everything. But the shows we did attend, were excellent. 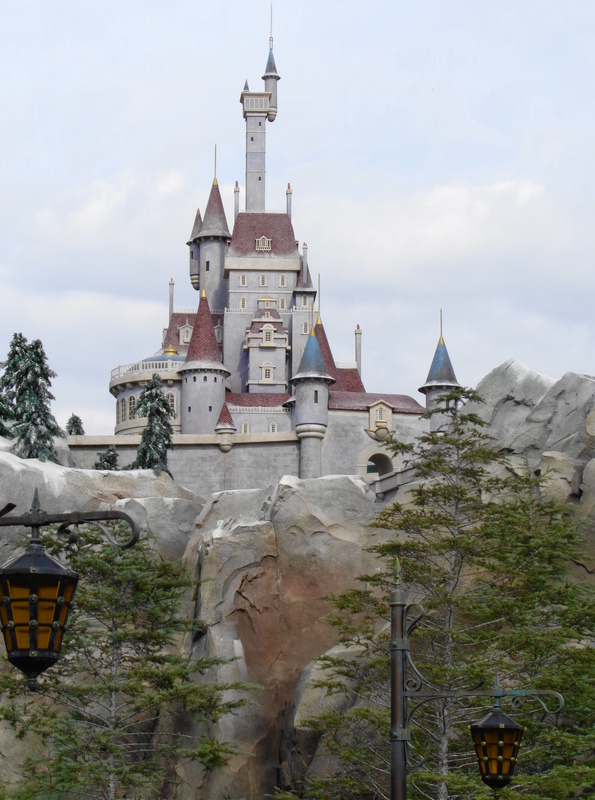 Each Disney park has a ‘signature’ building/attraction, such as Cinderella’s Castle in the Magic Kingdom, or the sphere at Epcot. 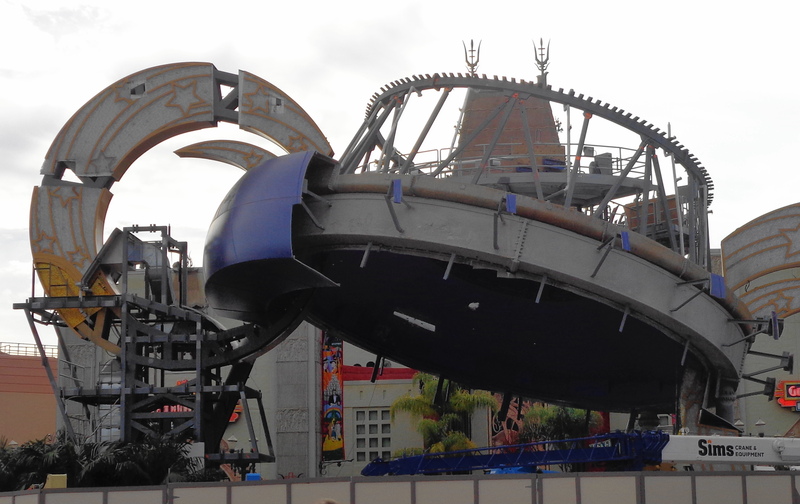 The Studios used to be the Sorcerer’s hat, but this is all that remains of the hat. I have no idea what will go up in its place, or why it is being removed. If anyone knows, please feel free to add a comment. The map of the park does not even mention this display, and simply has a blank spot on the map in its place. 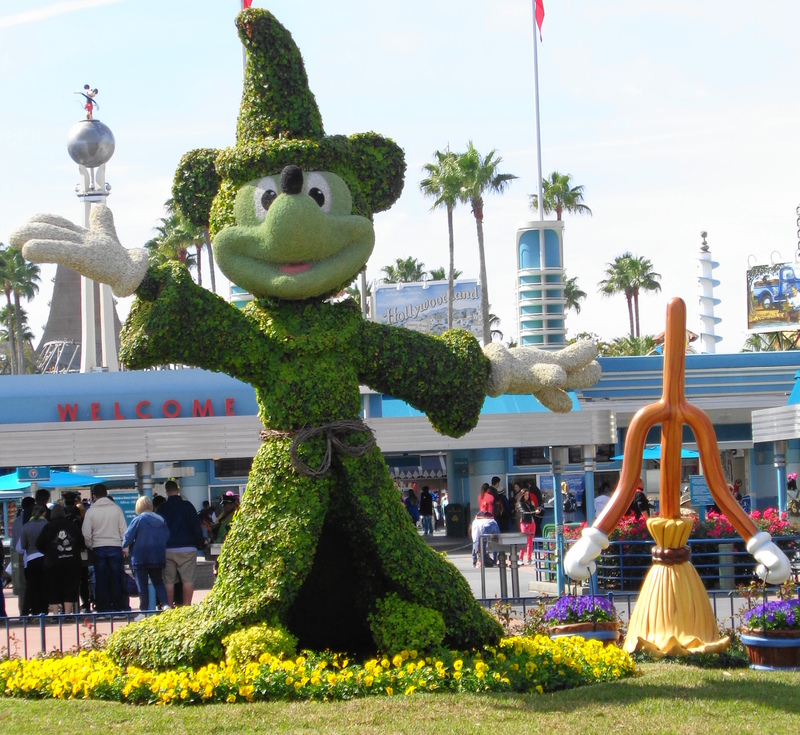 There is a topiary design outside of the park that shows Mickey with his hat. Since I never saw the movie, I am not really sure what the broom thing is next to him. 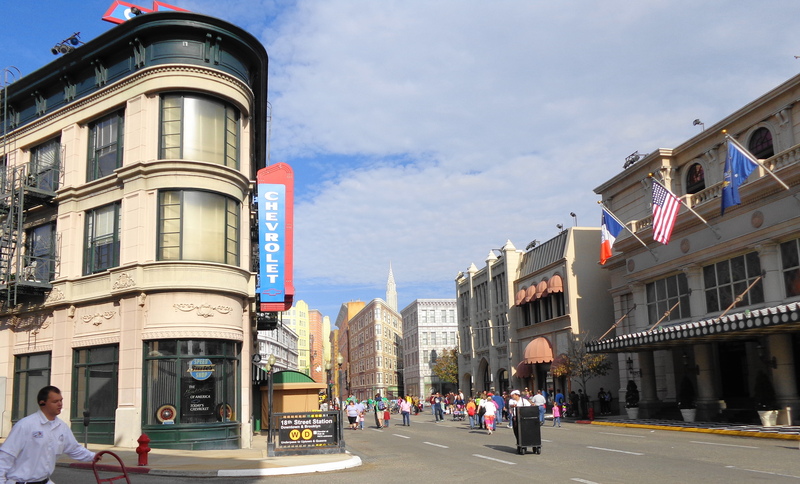 The first section of the park is a recreation of the shops along Hollywood Boulevard. 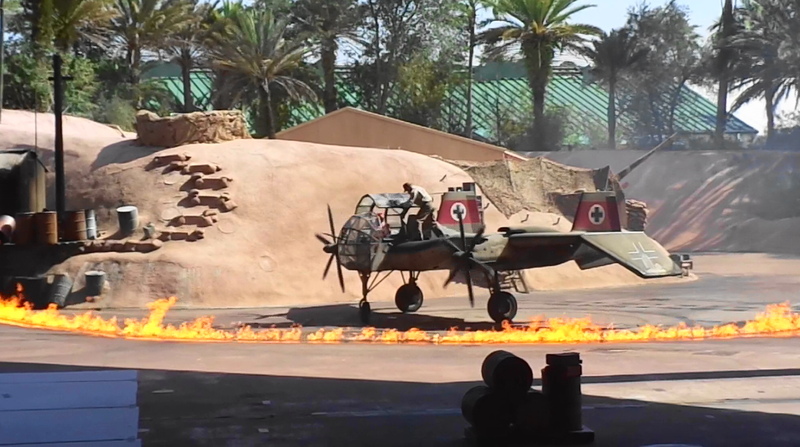 We ventured over to see the Indiana Jones Epic Stunt Spectacular, which is a 30 minute live action show to demonstrate how movies are made and stunts are performed. 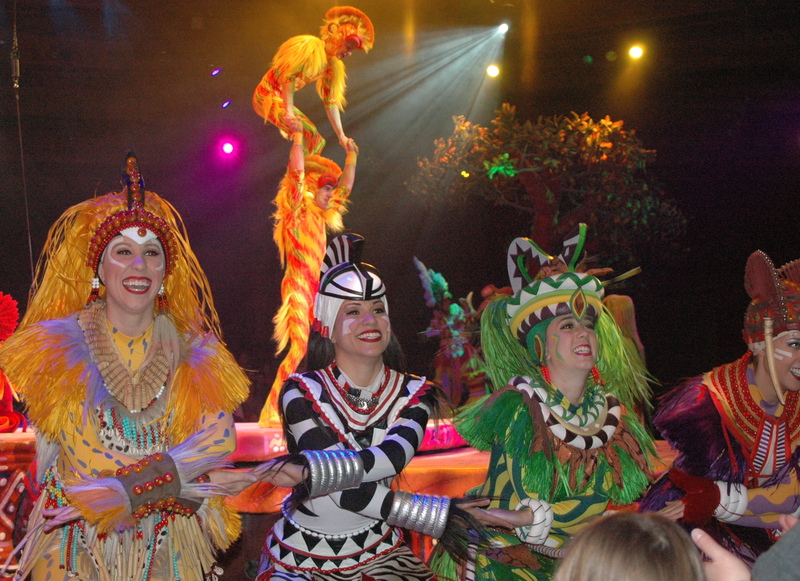 You can do a FastPass for this attraction, but the show seats several thousand people, so it is not always necessary. 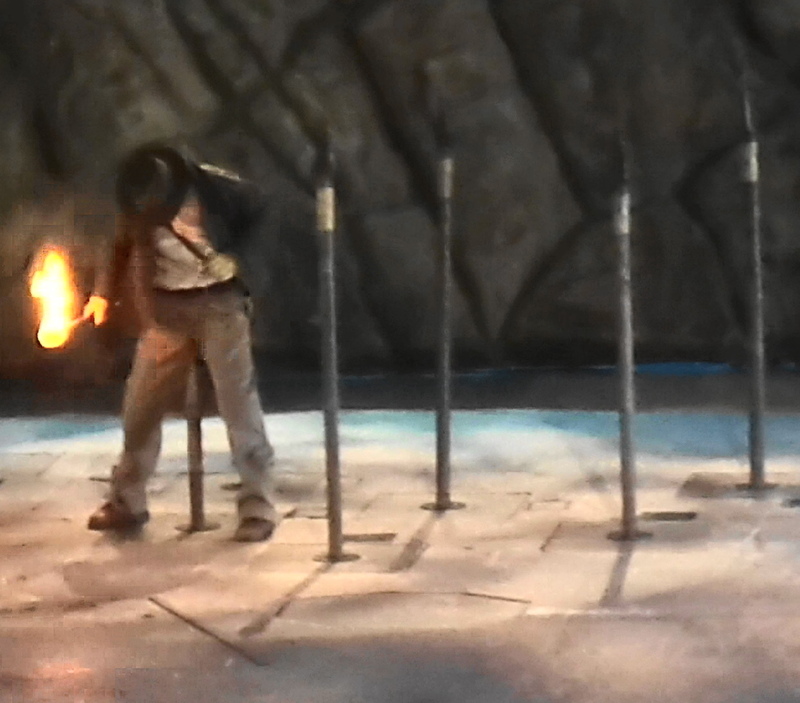 The show begins with Indiana Jones rappelling down a rope, and running across while dodging stakes jutting up from the stage. After this scene is complete, we can see how they clear out the set, with the next stage set brought in by tractors for the next shoot. 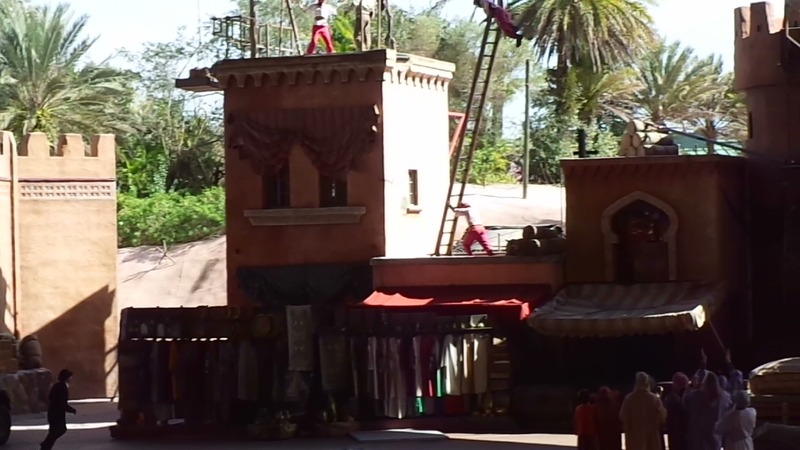 The next scene is put in place and there is a fighting scene that goes across the top of the buildings. 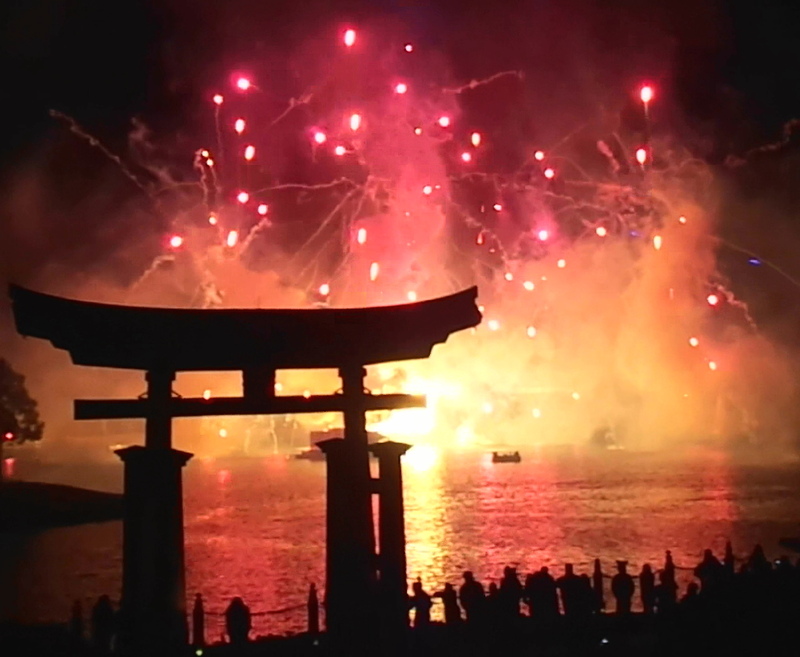 The final scene has a lot of pyrotechnics. It was a very enjoyable show. 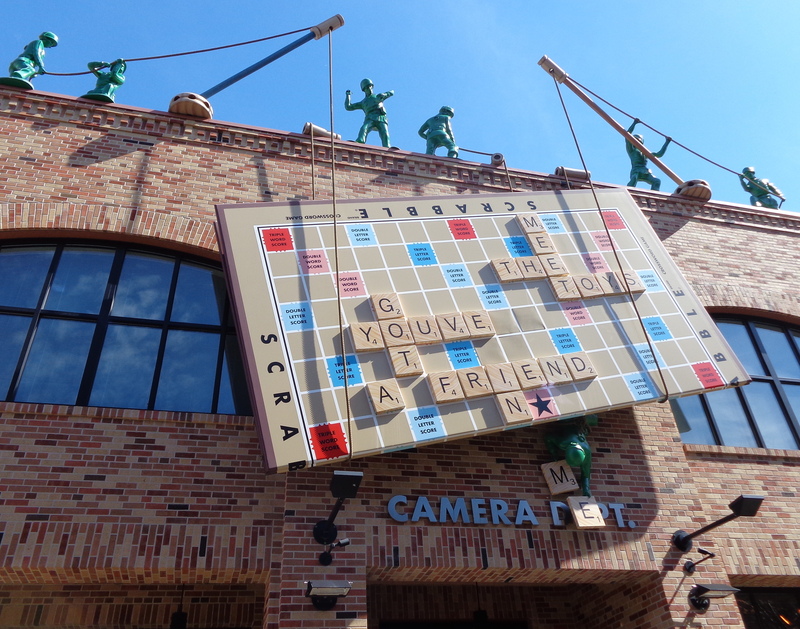 After Indiana Jones, we headed over to the Pixar Studios area, to ride the Toy Story Midway Mania. We had FastPass reservations for this ride, and I would highly recommend using one of your three choices on this attraction. It was a blast! 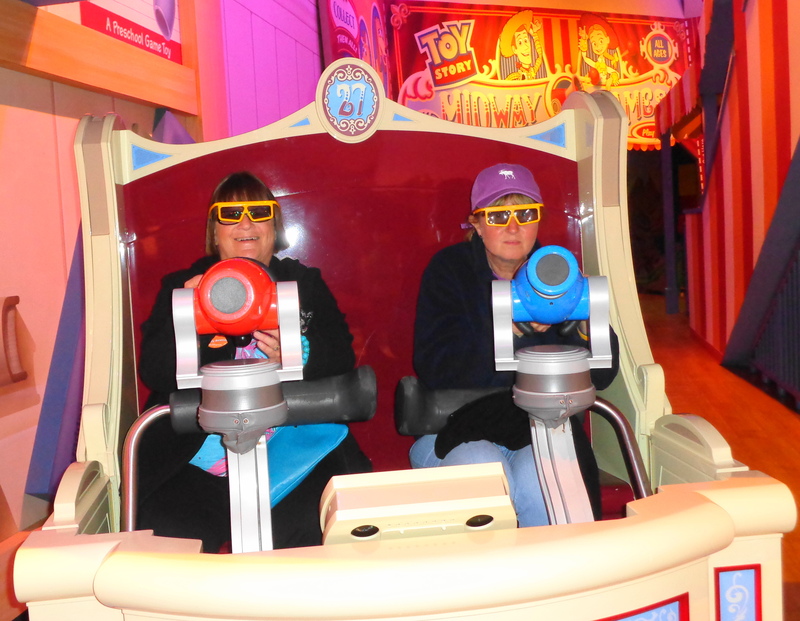 You go through a 4D arcade game, shooting at toy story characters. This is a great ride for all ages and abilities. Here is Karen and her friend Patty, all set for the game. Waiting in line for the ride is fun as well, just looking at how they have decorated the walls, with our favorite board games growing up! 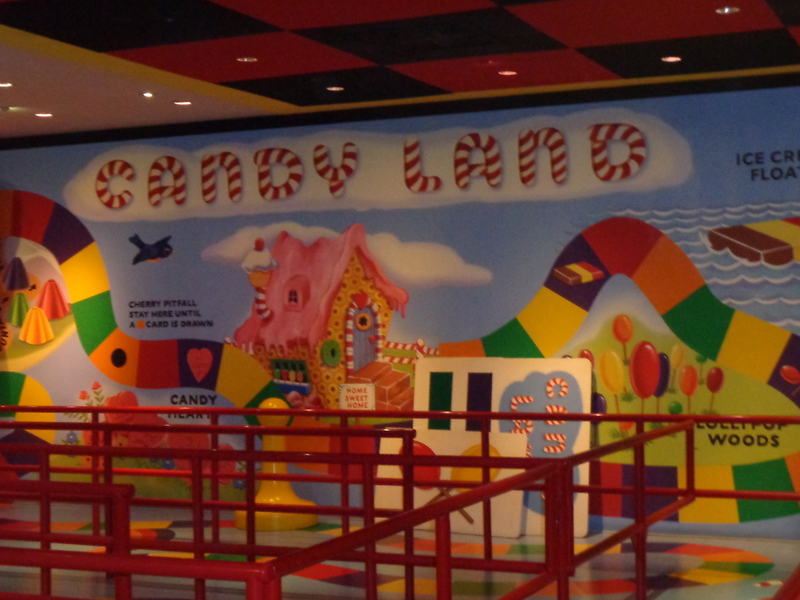 Candyland on the wall, and a checkerboard on the ceiling. And the giant Etch-a-Sketch was doodling out puzzles. Outside, the Pixar area continued the theme of the popular games we played as kids. 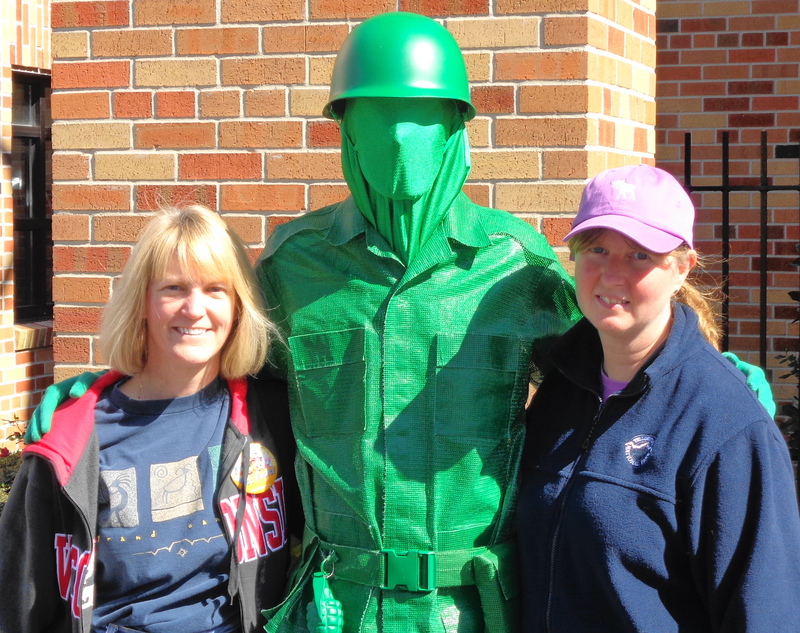 And who can forget the plastic green army men? They even have the melted shoes on this guy. (if you played with these army toys, you will understand that!) Karen and I had to stop for a photo. Next up, we headed over to The Great Movie Ride, which is an easy 22 minute tram that takes you through the sets of various movies. It was very enjoyable, but I’m still trying to figure out why they have a disclaimer that it may be frightening to children. 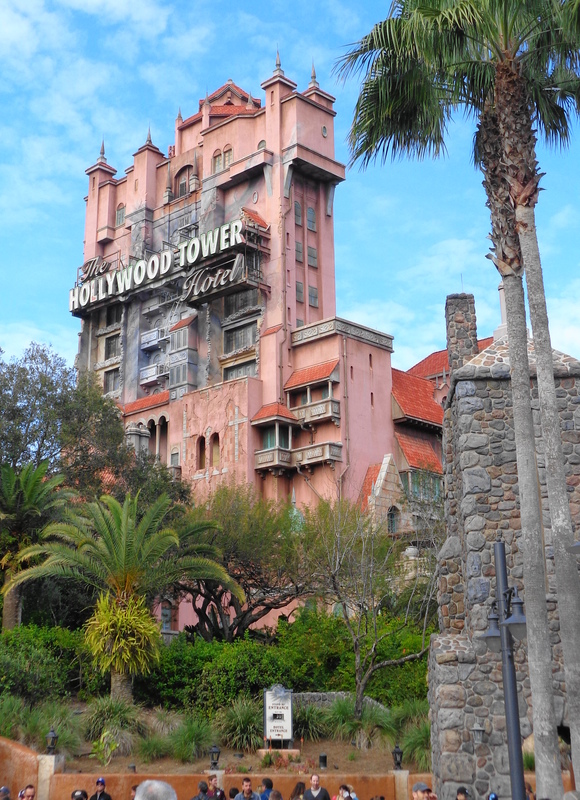 And speaking of frightening rides, we headed over to the very popular (use your fastpass) Twilight Zone Tower of Terror, where you go up in an elevator, and it randomly drops you down, then shoots you back up, and drops you down again. The ride is always a different experience, because you never know how many floors you will drop or shoot back up (it is all in the dark). 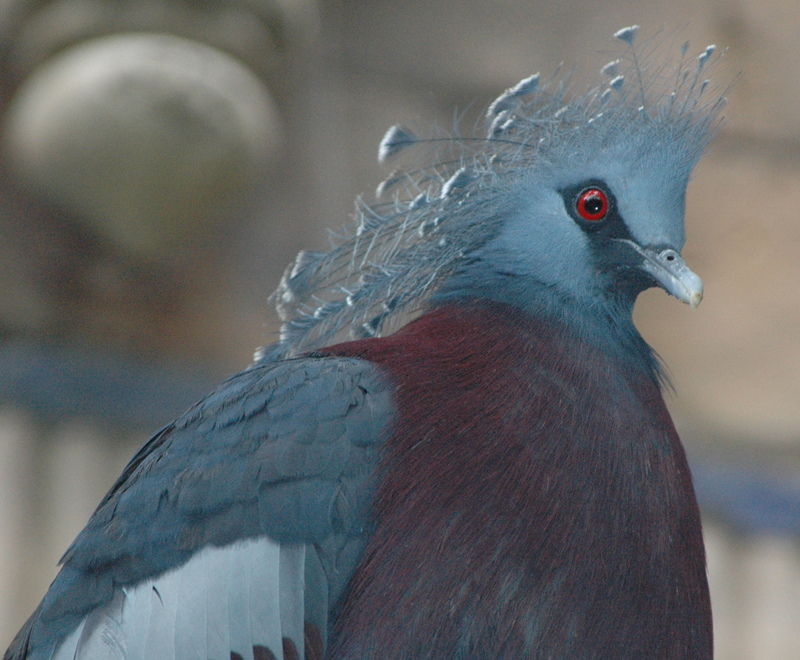 And when it shoots you back up, the doors open, and you are just staring out into the park. That is the part I had a problem with! I would go on this again, now that I know it’s is not “that bad”! They also have the Rock N Roller Coaster at this park, but you can’t do both with the FastPass. That coaster apparently goes upside down, and bangs you around a lot, according to Al and his cousins. If you like roller coasters, then you would probably like that one instead of the Tower ride. 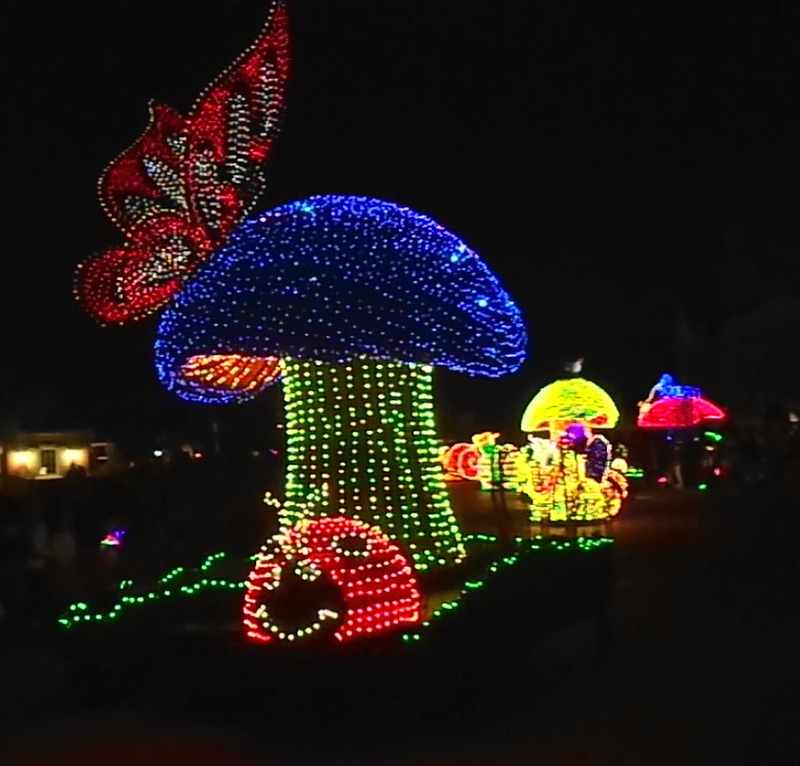 We headed back across the park to get in line for the Lights, Motors, Action! 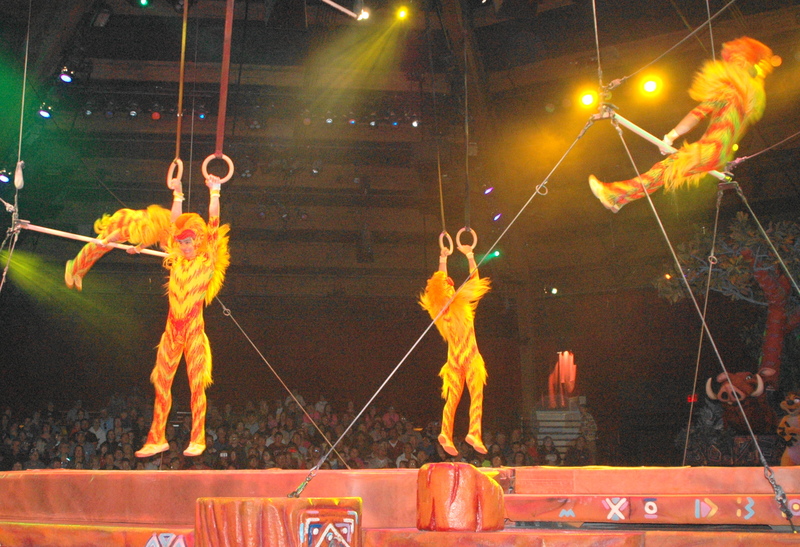 Extreme Stunt Show, which is currently performed twice a day. 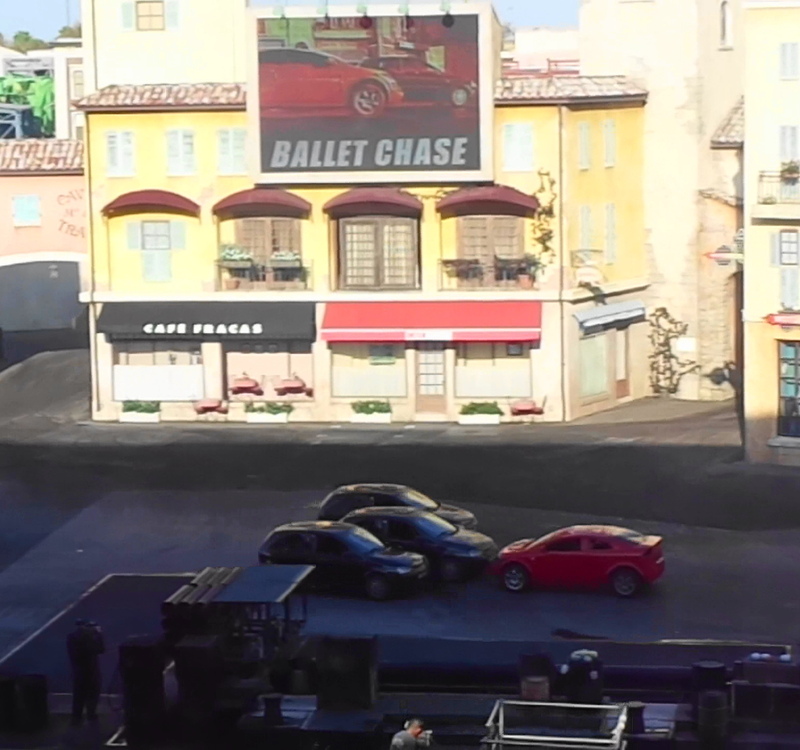 You get a behind the scenes look at how they perform and film car and motorcycle chase scenes. 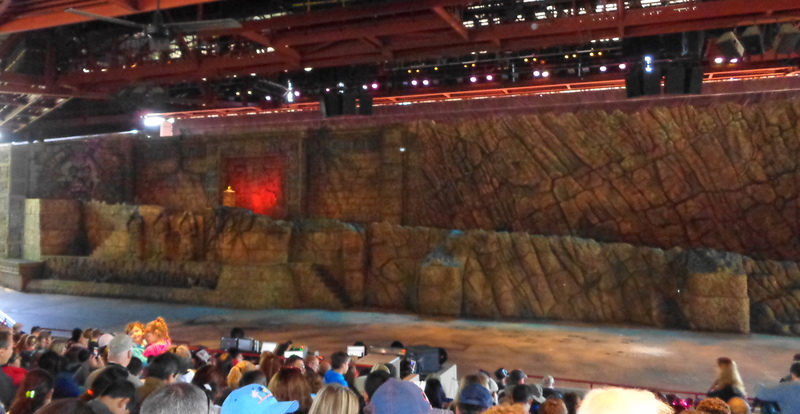 The outdoor stage for this attraction seats 5,000 people, so you probably won’t need to use your FastPass for this. 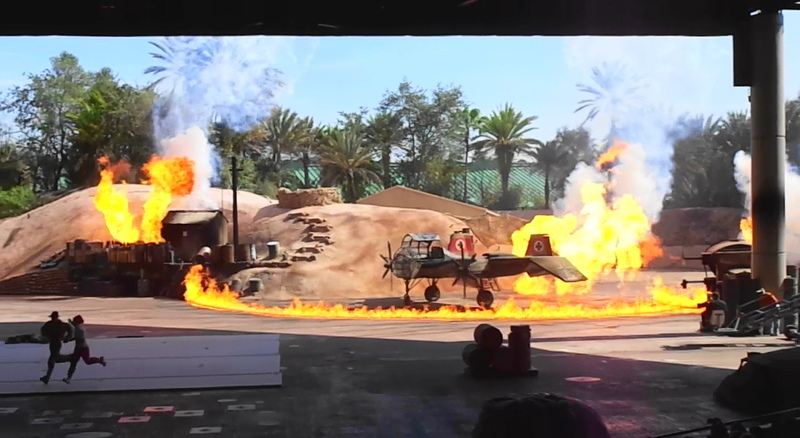 The show is about 40 minutes long, and was very interesting to watch the great stunts. 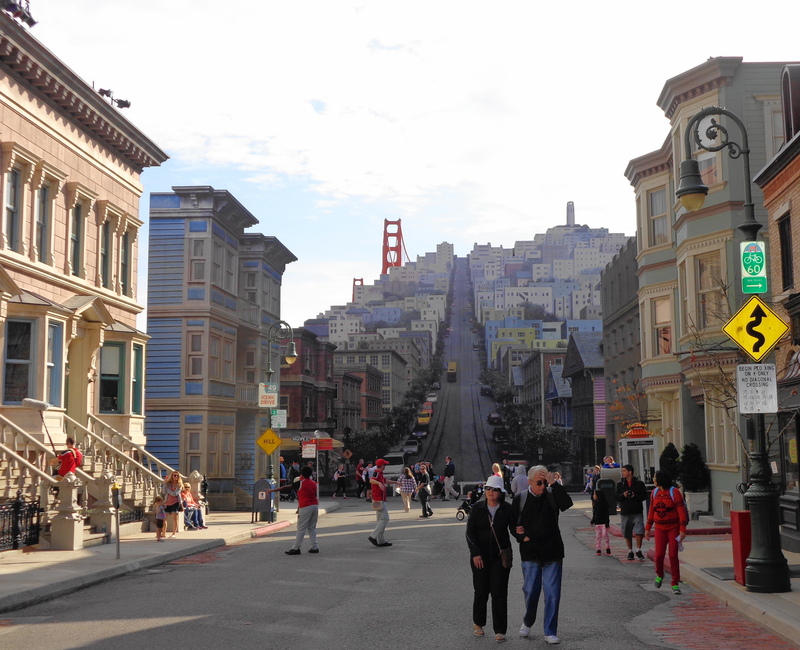 After the stunt show, we wandered through a street set of New York City, and a painted wall of San Francisco. Our final FastPass reservation of the day was on Star Tours – The Adventure Continues which is a fun 3-D motion-simulated space flight with characters from Star Wars. 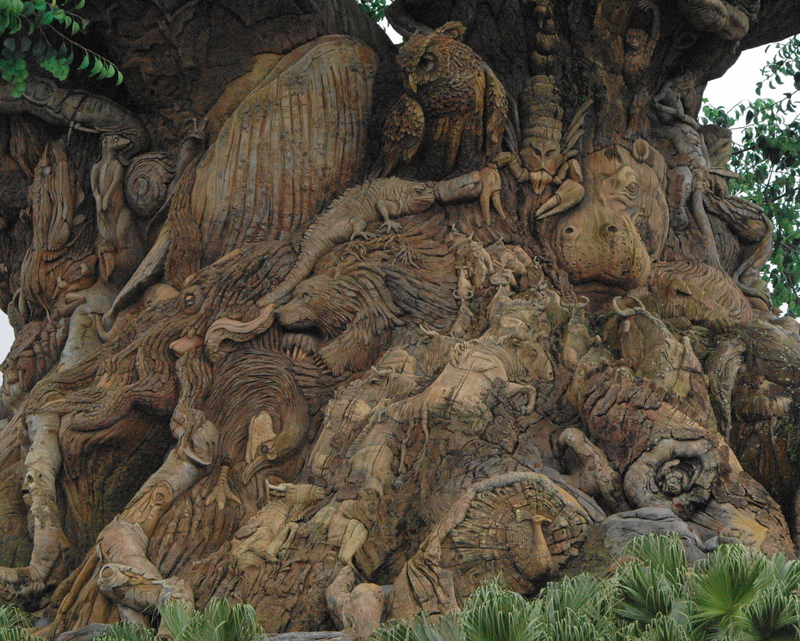 Disney also has this ride set so that each ride is a different experience, so you never know what to expect. This way you can go on this ride multiple times, and still have a different experience each time. It was certainly a fun for all ages ride. After a full day where we still did not get to see or do half the things in the park, we headed back to the campground to feed and play with the dogs. Al and Karen then took us to Disney’s Boardwalk by Epcot where we ate dinner, and walked over to Epcot to view the nightly IllumiNations: Reflections of Earth show. 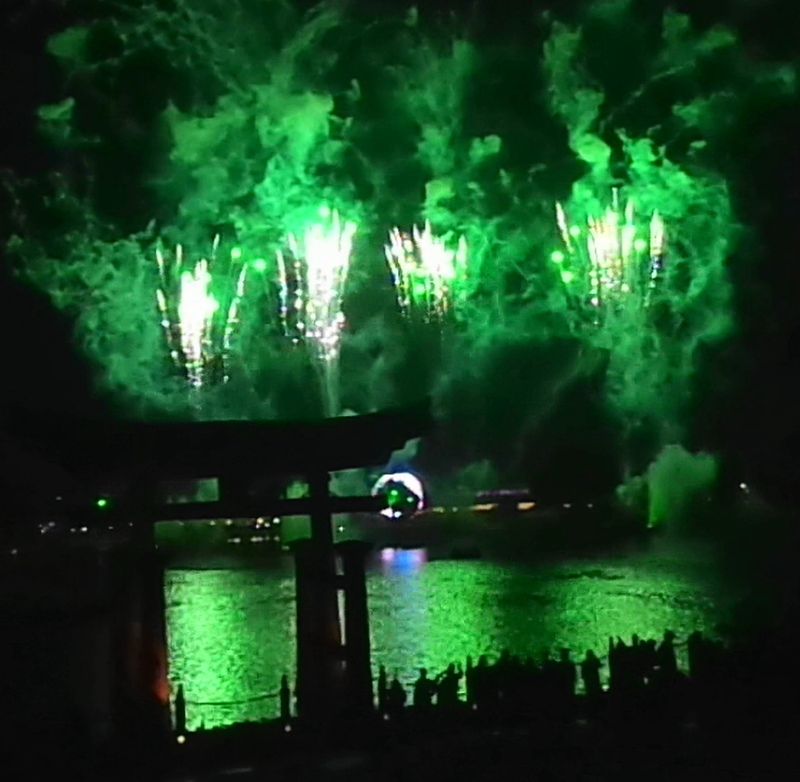 This is a laser light show, along with fireworks that you can view anywhere along the World Showcase. 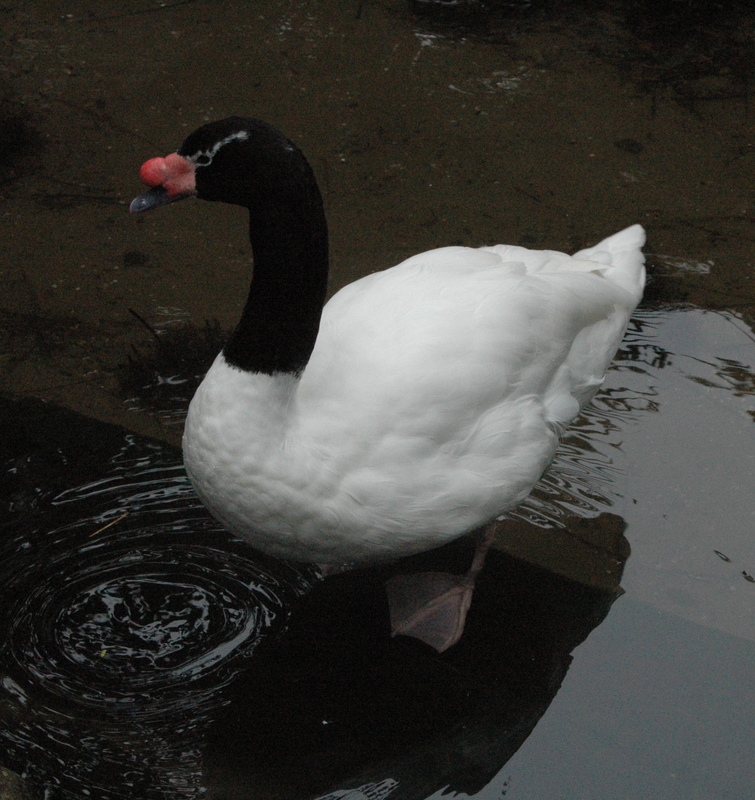 Here are a few photos that turned out from the show. After a busy first day at Epcot, Dan and I took the complimentary shuttle boat ride from Fort Wilderness to the Magic Kingdom for the evening. Karen and Al, along with his cousin Bill, would be taking a later boat over and joining us for the parade and fireworks. 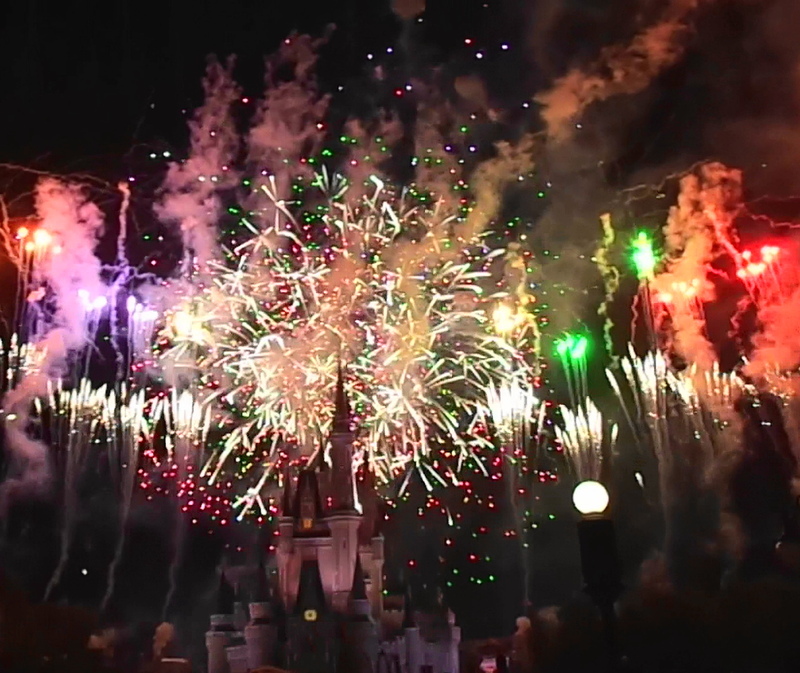 This would be our first visit to the Magic Kingdom. And needless to say, we were immediately lost without our tour guides! Upon arriving on the grounds, we had no idea what to see or do, and actually had to get a map! 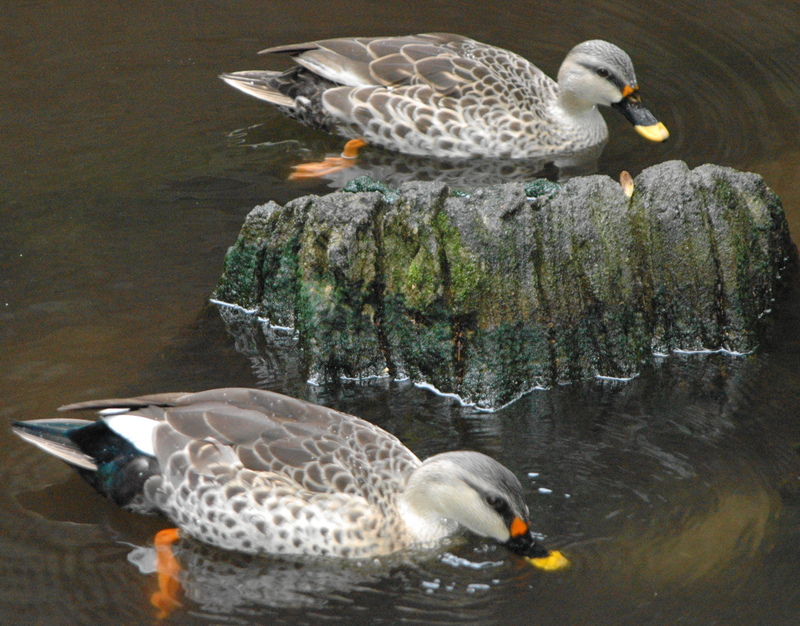 We promptly texted our ‘tour guides’ to see when they would be arriving, and they were on the next boat over…whew! 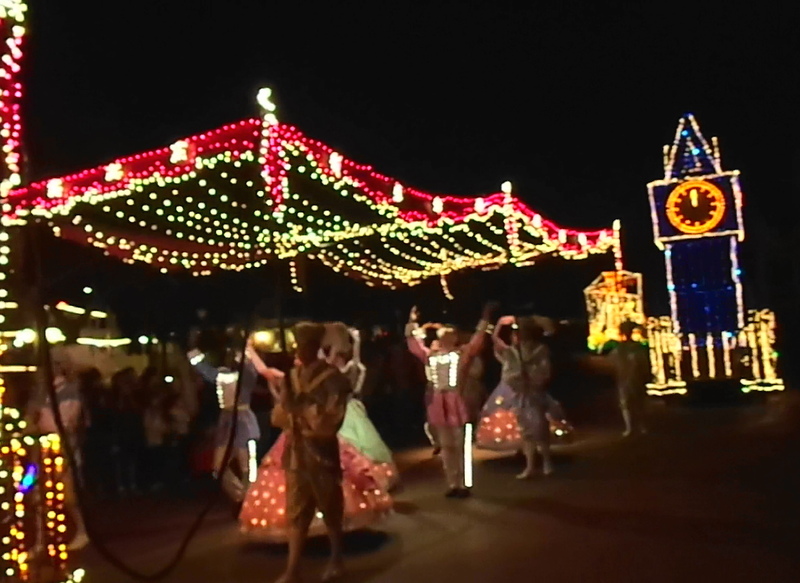 Even though it was only 6:30, people were already lined up for the 8:00pm Main Street Electrical parade, making it difficult to wander through the crowds to see anything. We quickly became overwhelmed as we had no idea what to see or do, so we found refuge in a gift store and waited for the rest of our party. When you live in an RV, it’s easy to avoid buying souvenirs, as we have very limited space. But it’s always fun to look, and Disney seems to excel in merchandising. You will see I am wearing neon mouse ears in the photo below. These were a gift from a former co-worker, Katie, from her honeymoon in Disney! She was happy to know they made “the cut” when it came to deciding what to pack in the RV! Thanks again Katie! Karen, Al and Bill quickly found us in the gift shop, and then we headed out into the park and they gave us a quick explanation of the six different themed areas of the park. 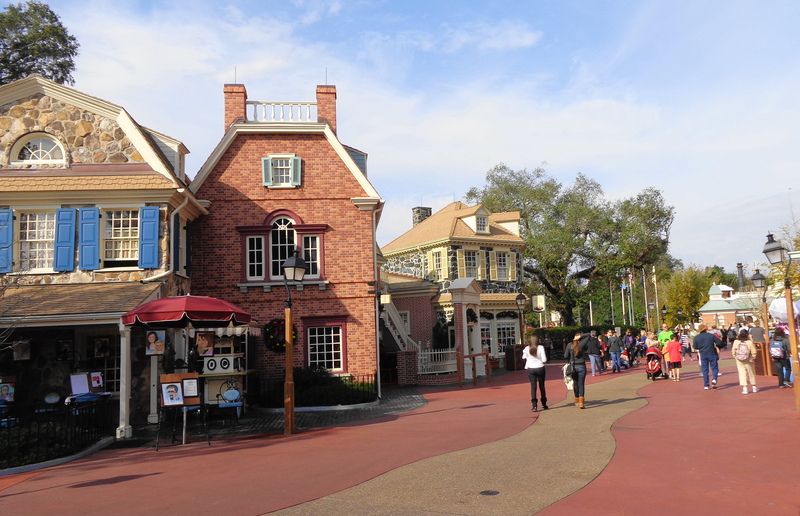 Since we would be returning to the Magic Kingdom on Wednesday, this gave us a brief overview of the areas we needed to see during the day. 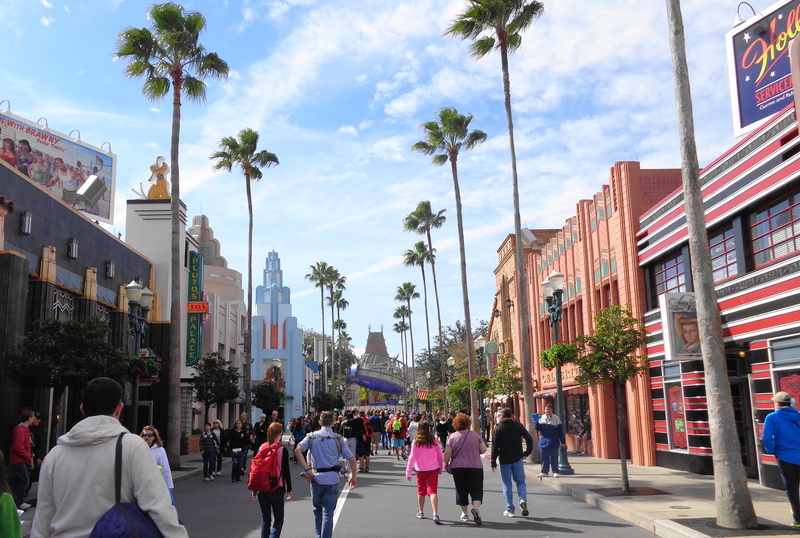 We wandered around the Main Street, USA area for a while, taking in all the sights and sounds before heading over for coffee and dole whips (a fresh pineapple dessert). 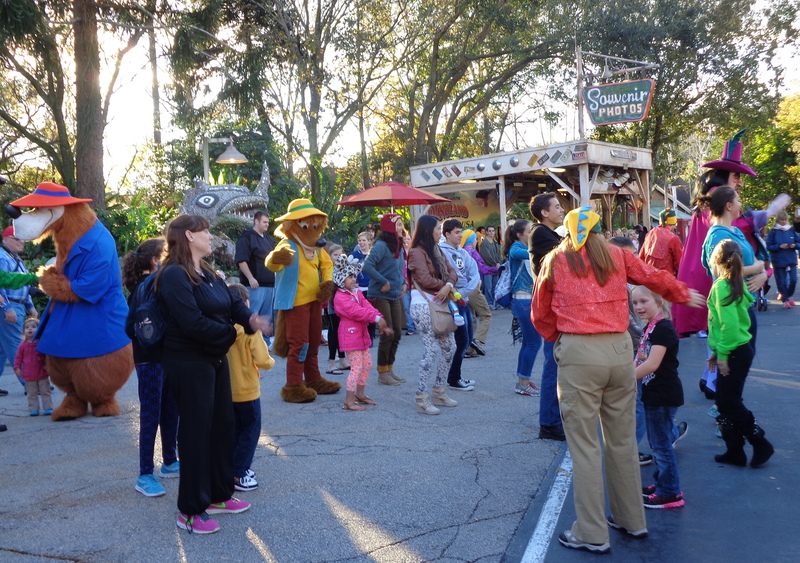 Then we headed to Adventureland to stake out our parade route. 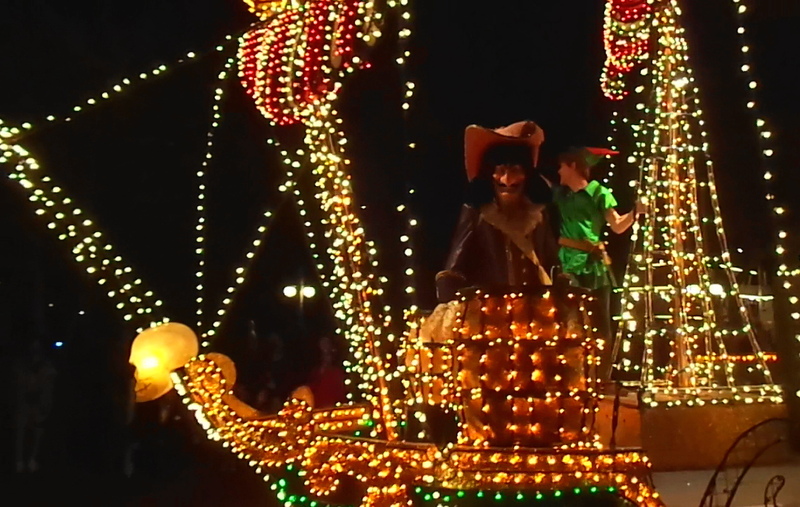 There was nobody there before parade. We thanked our excellent tour guides for again leading us in the right direction…away from the crowds. No sense standing 10 deep in line at the Main Street area, when we can have our own personal space in another area. 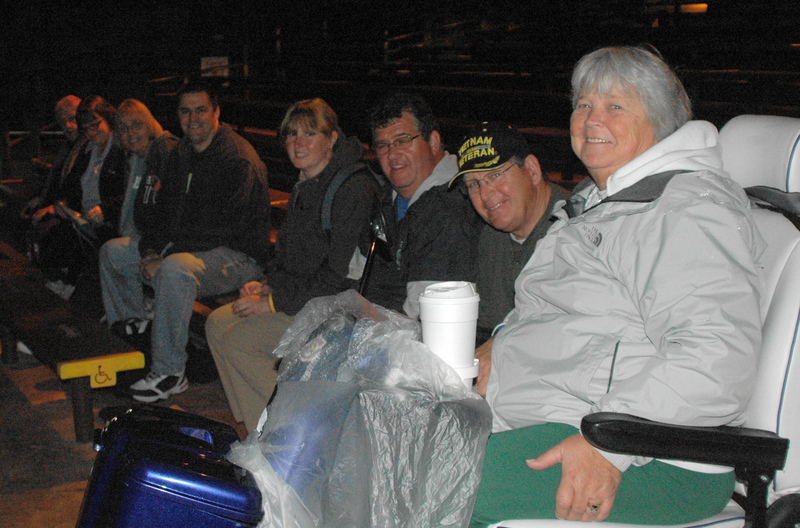 Once it was close to the 8 pm start time, the area quickly filled up, but we had our front row spots. 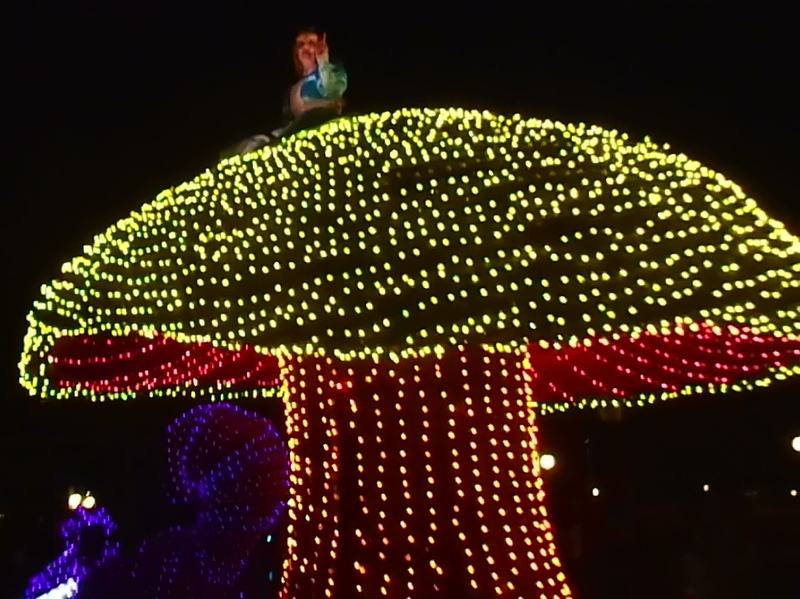 The Main Street Electrical Parade is a 20 minute parade of floats and characters covered in LED lights, with music playing across the parks loudspeakers. 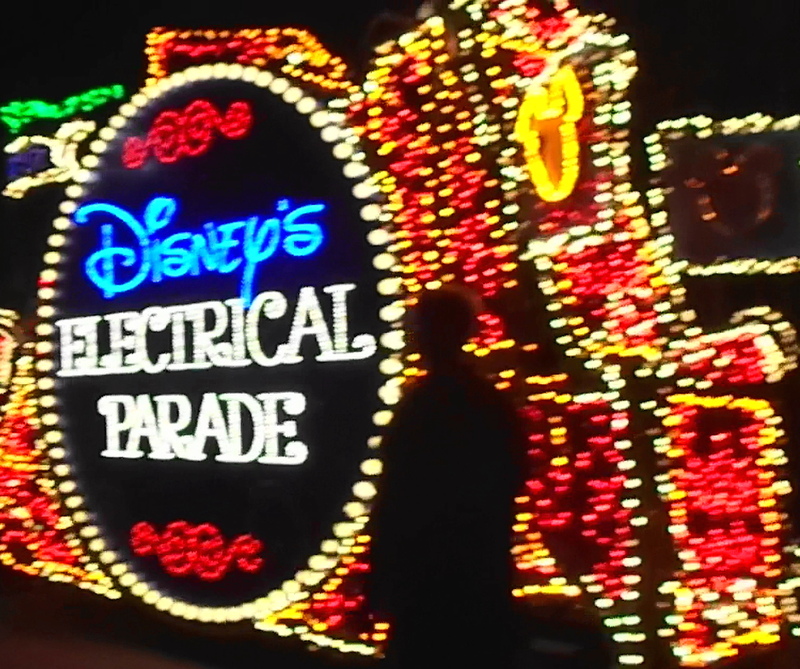 I love parades, and this was very enjoyable, and a must see item at the park. 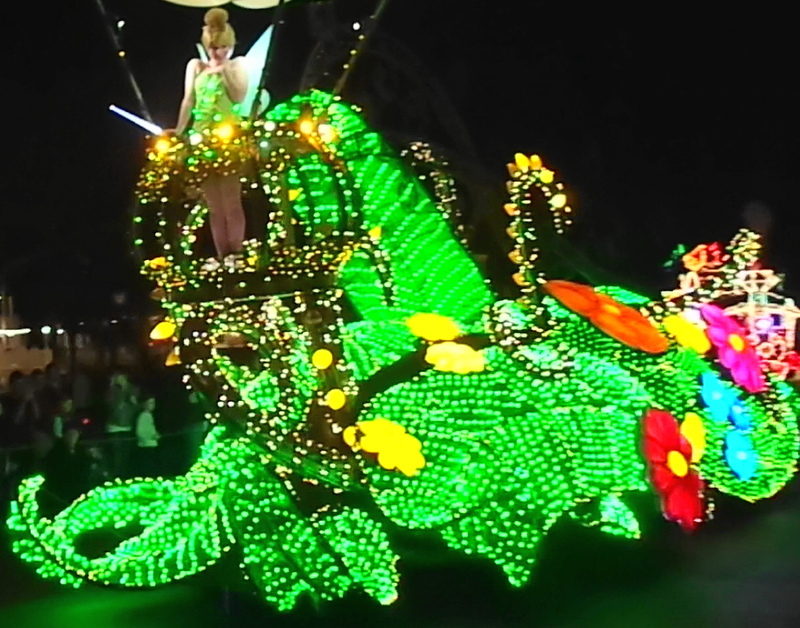 Tinkerbell leads off the parade. 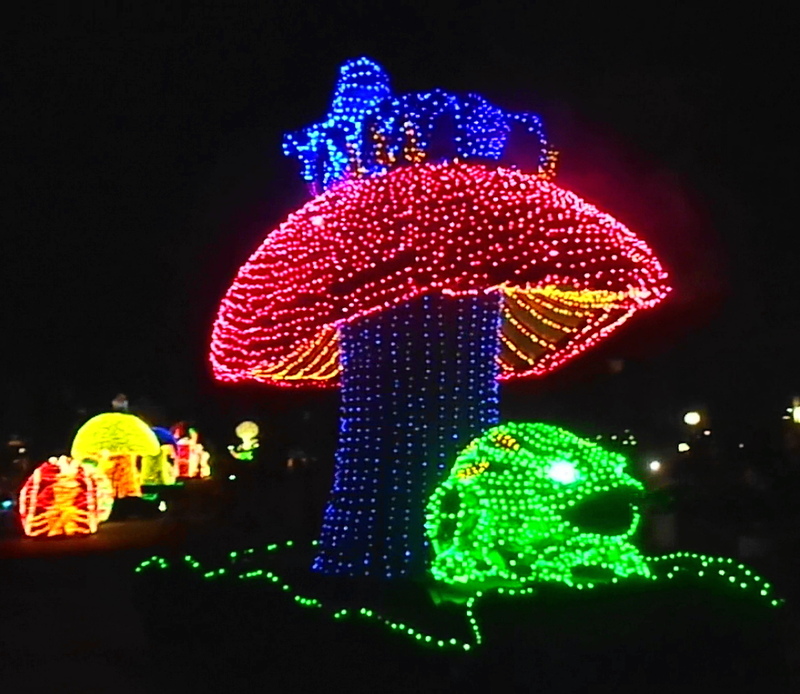 Alice in Wonderland…not sure why she is on a mushroom. Someday I will see that movie! 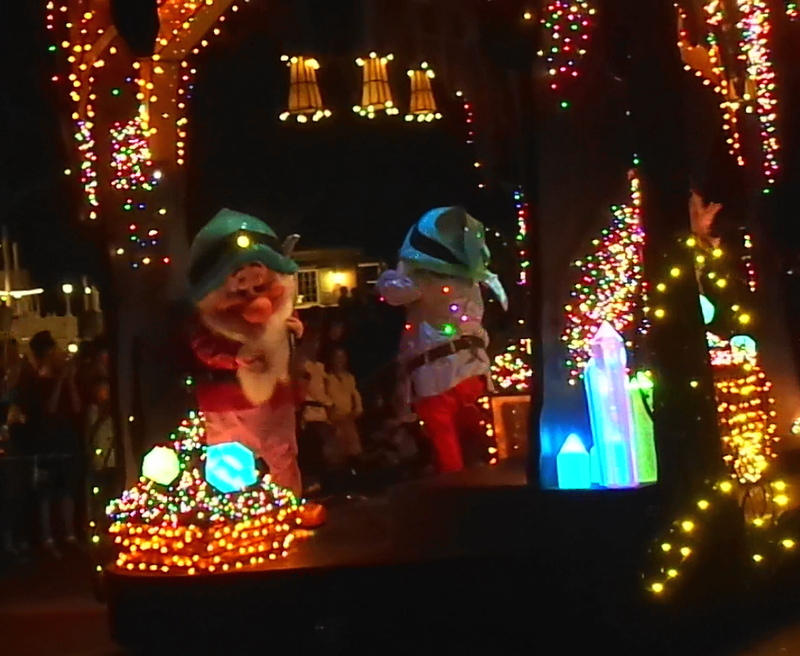 Lot’s of Disney characters were in the parade, so it was fun for me to try to figure who they were. Some were obvious. 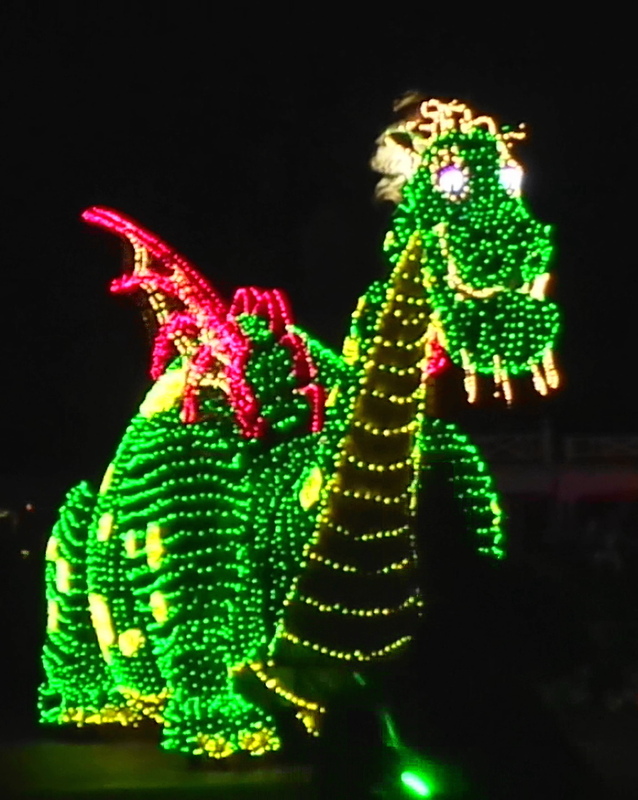 I thought this was Puff, but Karen told me this is Pete the Dragon! 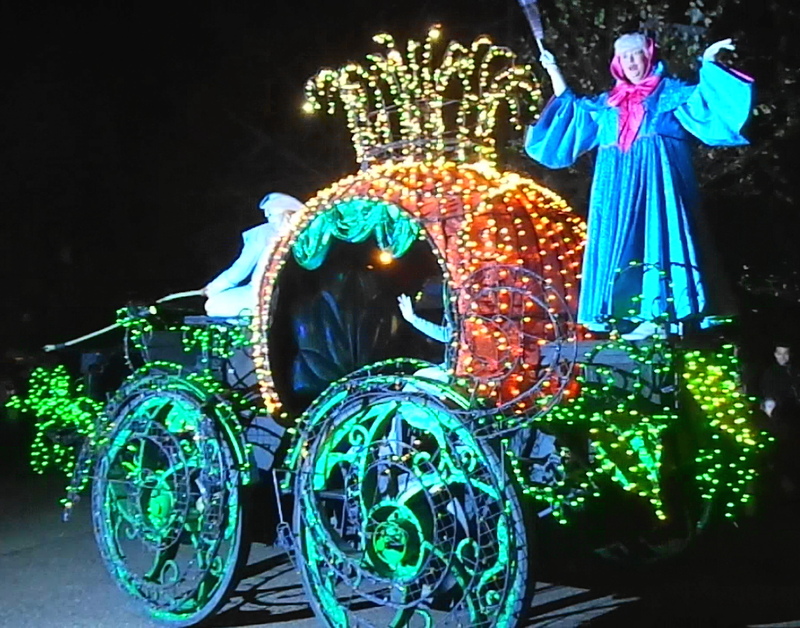 Behind Cinderella’s pumpkin coach, was a float with Prince Charming, hanging out with her step-sisters, who were having a lot of fun. They were followed by his majesty’s court, and the clock turning midnight. 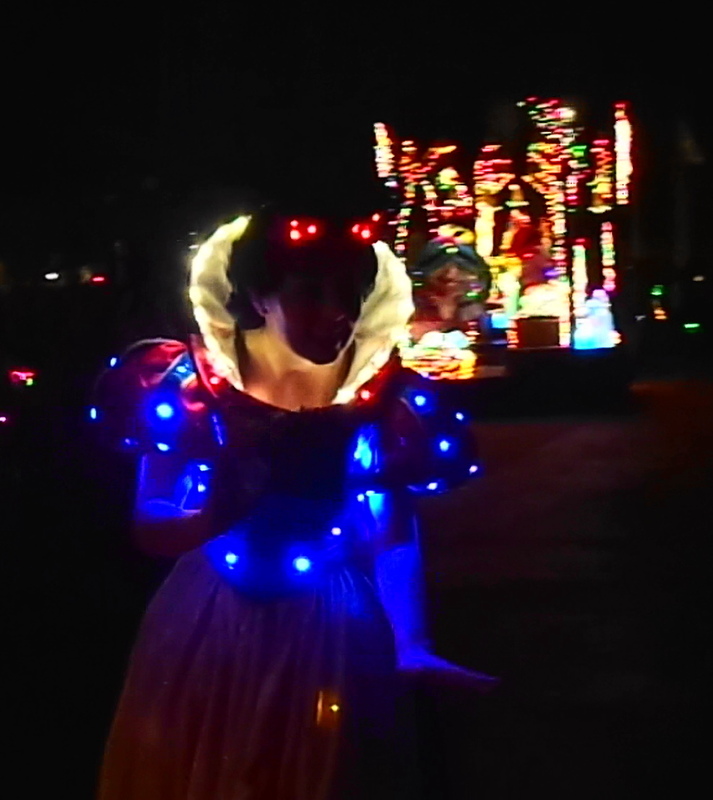 Snow White was roaming around the crowd. 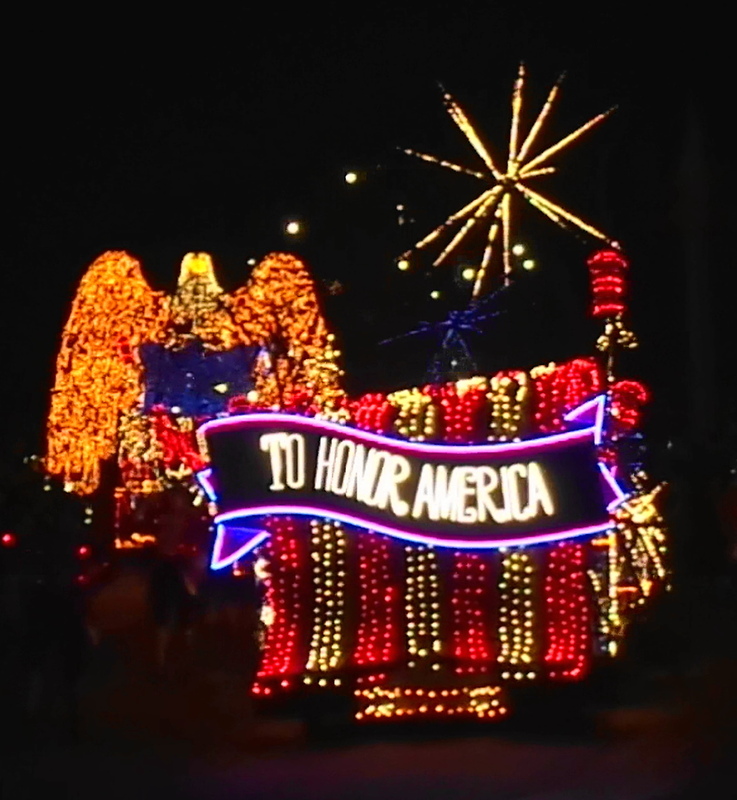 The last float in the parade was a patriotic tribute to the United States, complete with bursting “fireworks” and a bald Eagle. 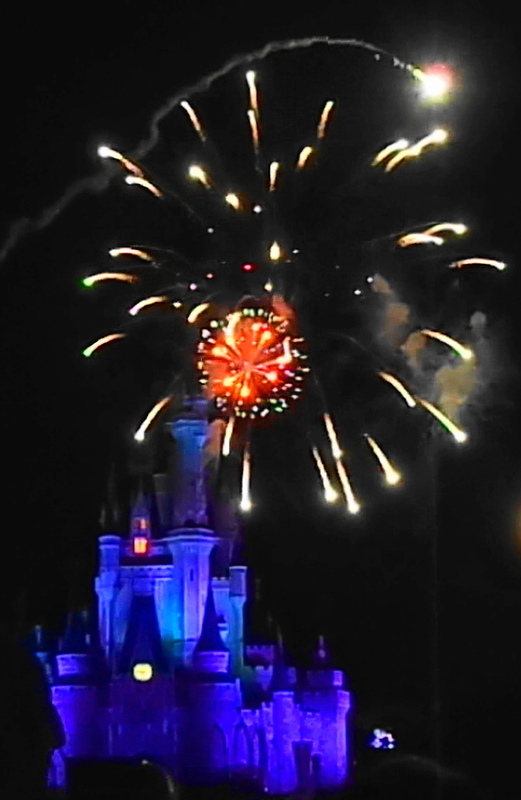 After the parade, we headed over to the main street area to watch the fireworks, formally known as Wishes nighttime spectacular. 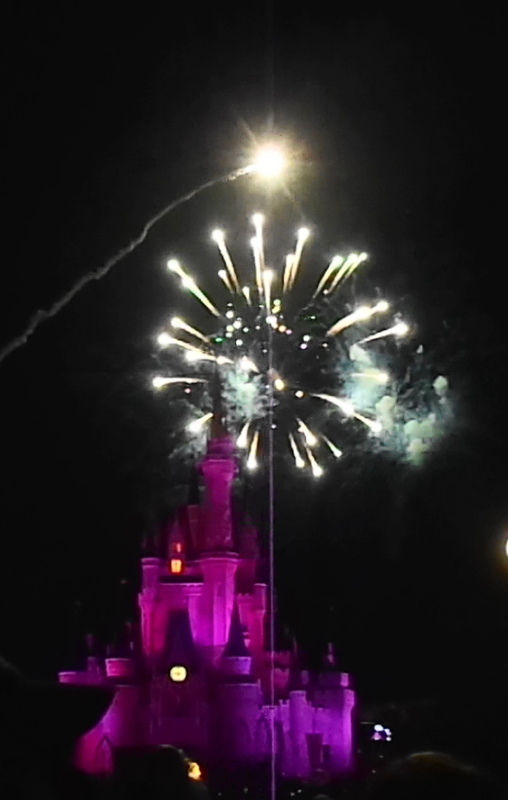 I was expecting a basic fireworks show, but this was an excellent light show displayed on Cinderella’s Castle, with an appearance by a flying Tinkerbell followed by fireworks. 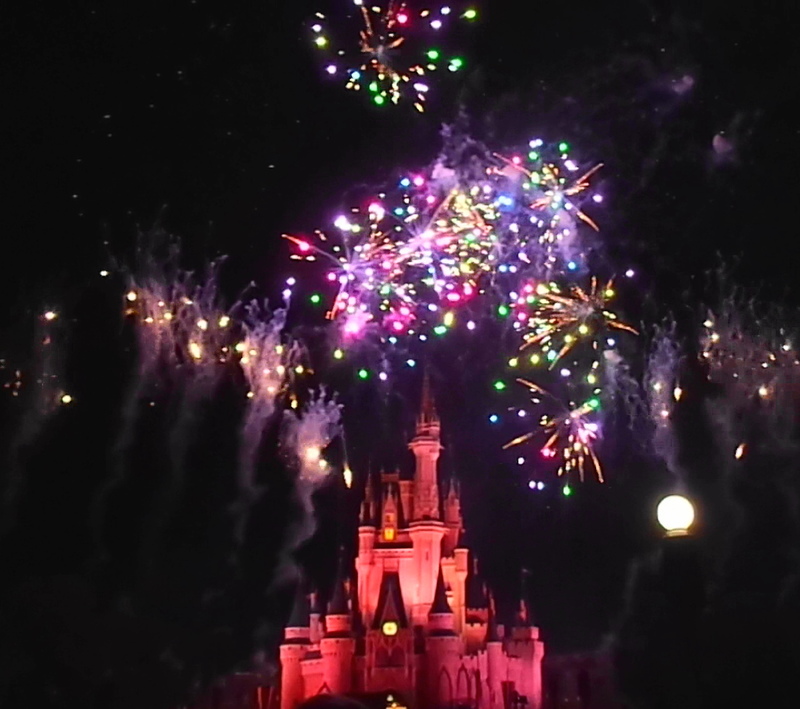 No matter how tired you may be after a day at Disney, this is well worth staying for. 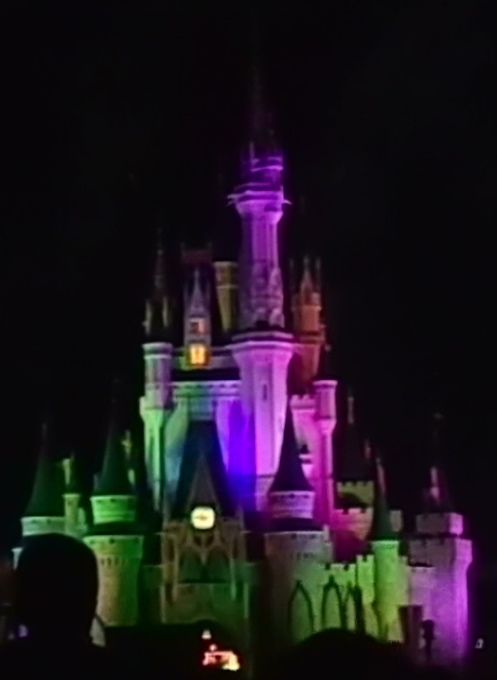 The castle is constantly changing colors during the show. 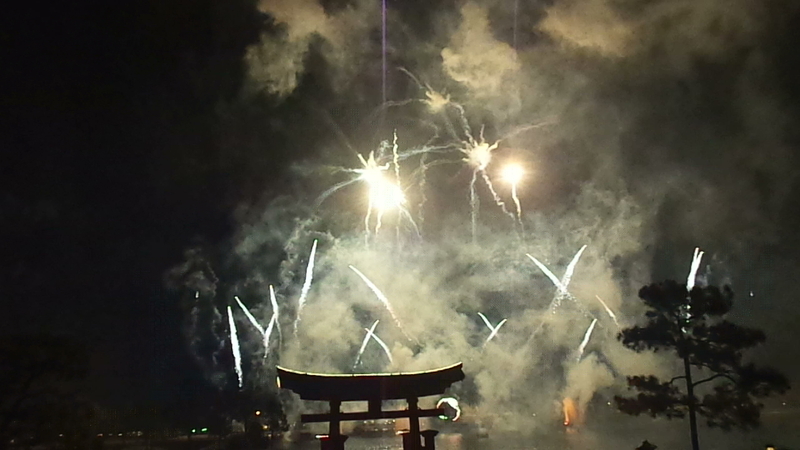 It’s hard to take photos of fireworks, so these are the best I could get from the show. 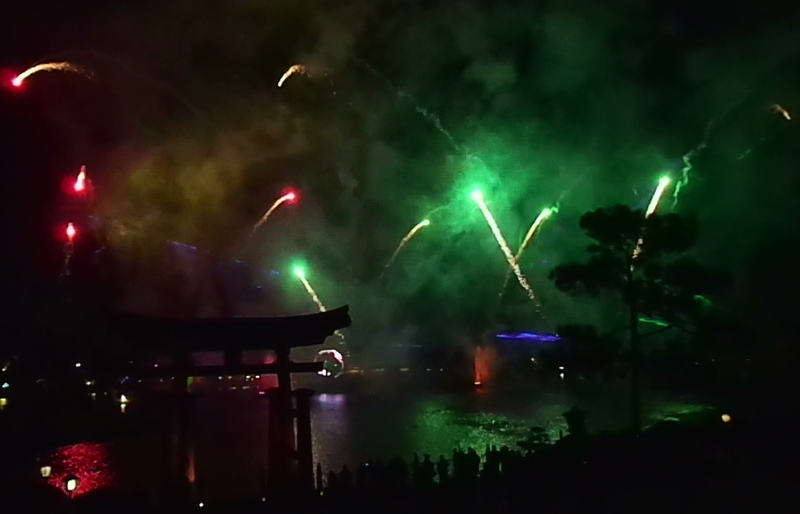 It was a great way to end a long, busy day seeing two of the four parks. And it was just day one!! Stay tuned for more of our busy Disney week. 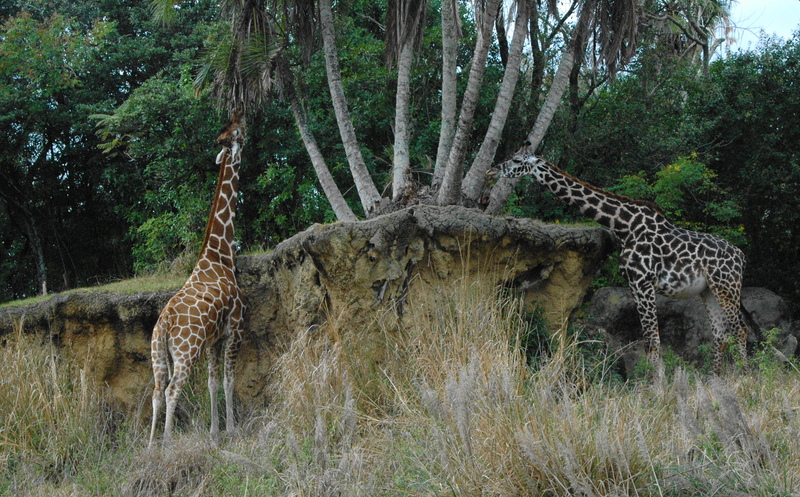 Although it has been a few weeks since last posting, I will be making up for that absence with a bunch of posts on our stay at Fort Wilderness Campground, on the grounds of The Magic Kingdom. After our first day, I had good intentions of putting a post out right away, but with so many photos and videos to sort through, plus being tired from playing tourist for 12 hours, I figured it would be best to wait until our “vacation” was over, and then work on the blog posts. And yes, I am calling it a vacation. Many of you may think we are on a permanent vacation, but the reality is we still need to work. Our ‘house’ just has wheels and a changing view! But for this week, we went into ‘vacation’ mode. 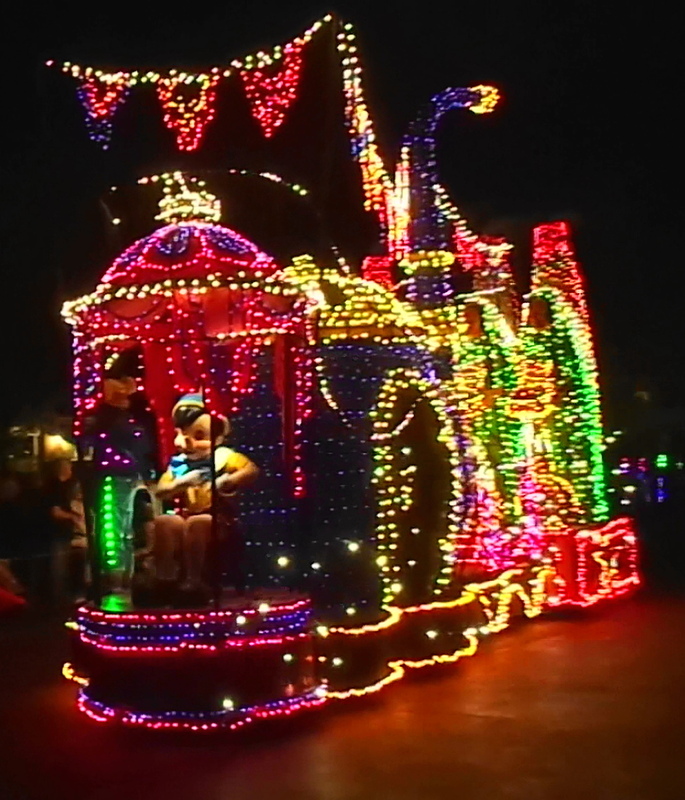 If you enjoy Disney, then hopefully you will also enjoy the next several blogs, as they will be all about Disney. If you are one of the few that can’t stand the big mouse, well……! But first a little background. 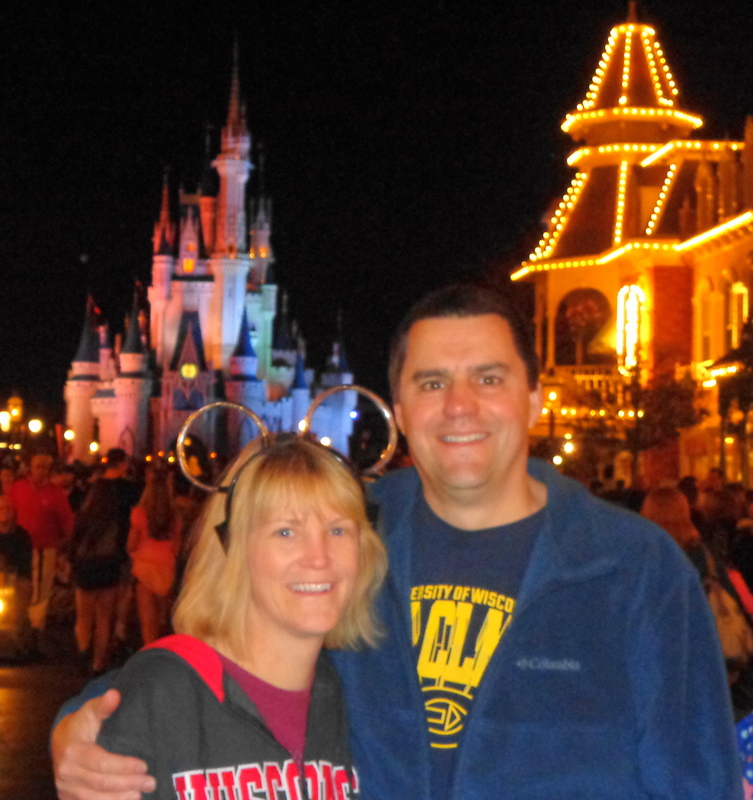 Last year we were invited to Disney by our friends Karen and Al, whom we had met at Amazon. Neither Dan nor I have ever visited any of the four parks at Disneyworld. 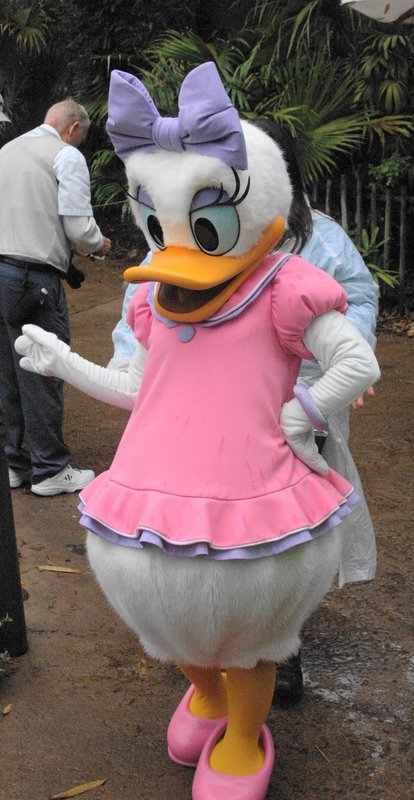 And when it comes to Disney characters, I am pretty clueless. 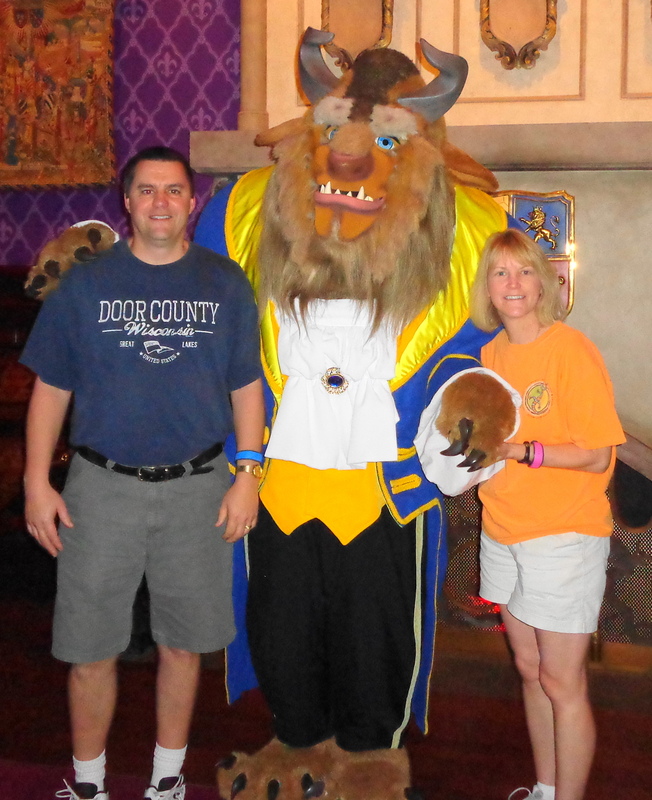 Karen and Al have been visiting Disney for years, and are very knowledgeable about the entire complex. 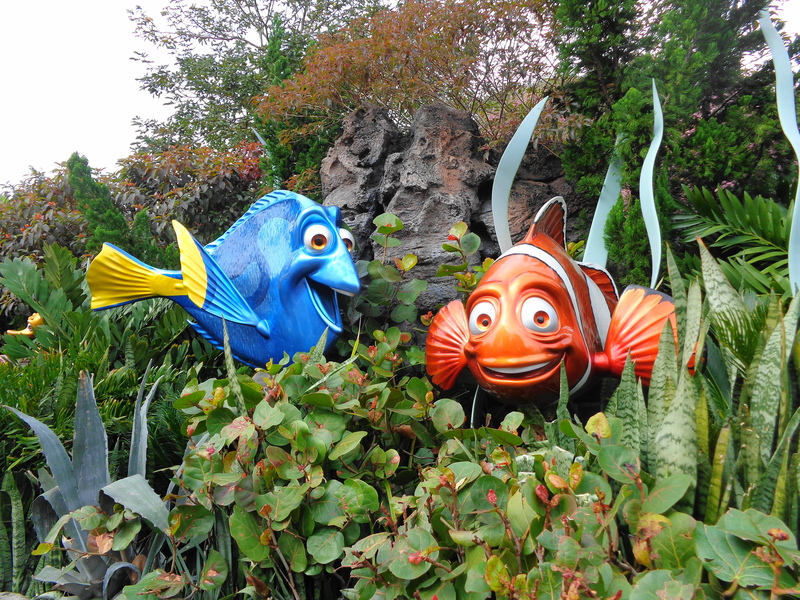 We hooked up with them last year for one day at Epcot, just to get a feel of Disney. 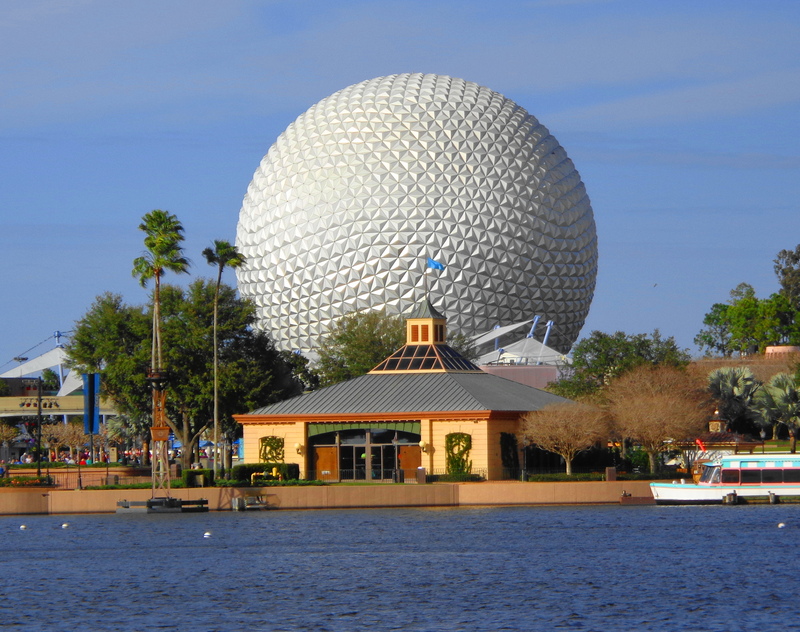 You can read about last years blog on Epcot here, as well as my blog on Disney history and pricing here. 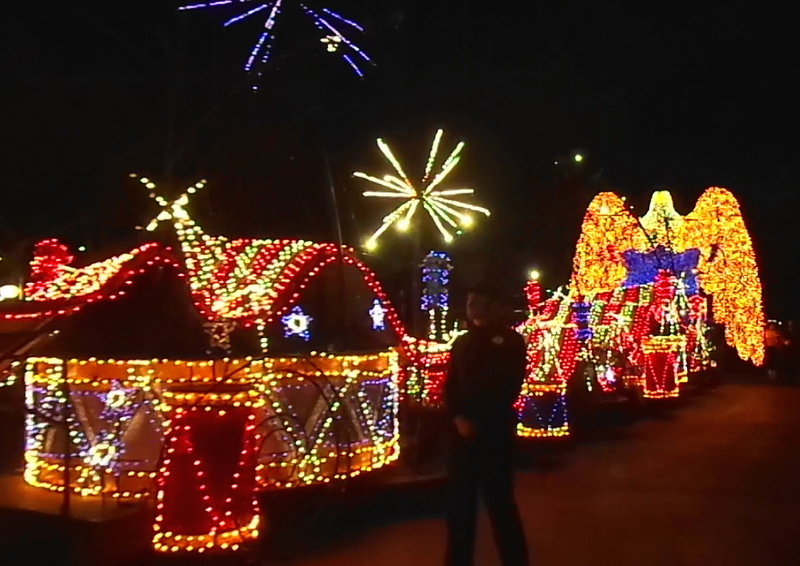 We had a great time last year, and decided to come back for a longer stay this year, so we could see all four parks. 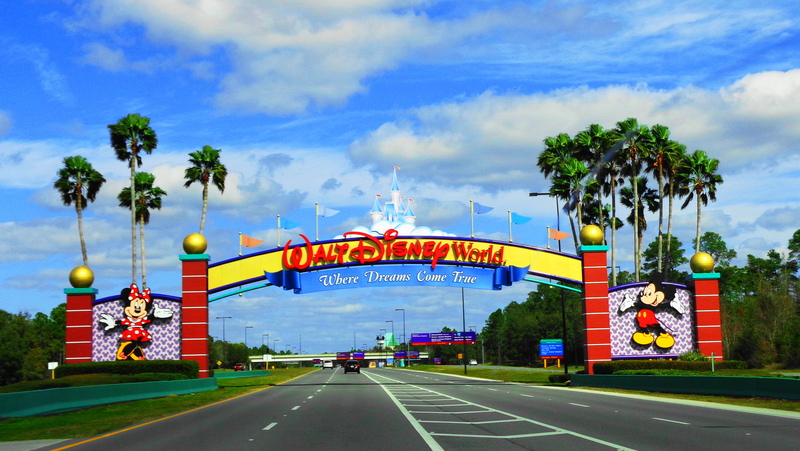 Our opinion that Disney is still very expensive has not changed, and they just reported on the local news that Disney recorded record attendance and profits in their last quarter. 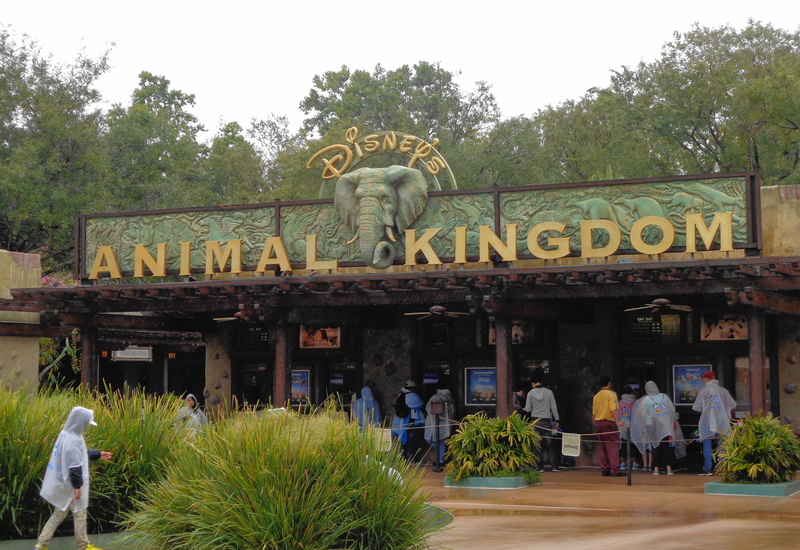 So Disney can continue raising prices, and it does not appear to have any affect, so far, on their attendance. But since we changed our residency to Florida, we can now get a resident pass. 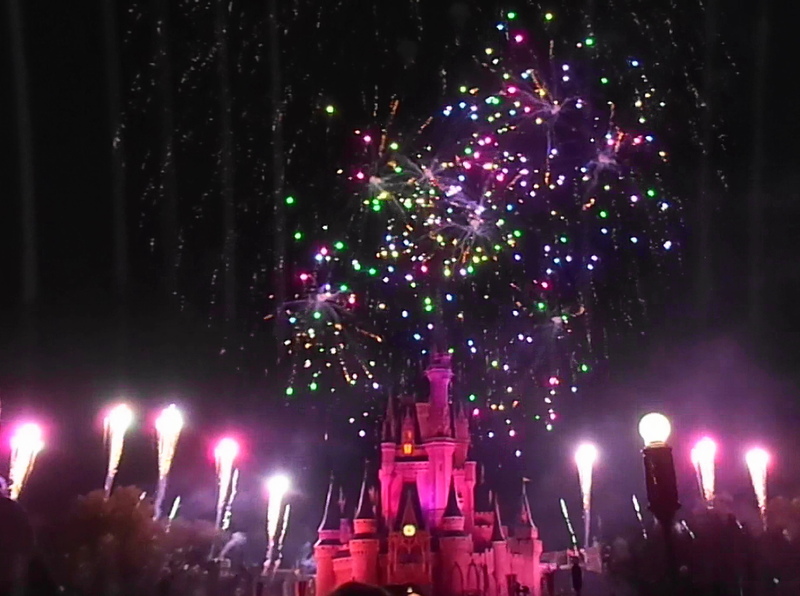 For $233.00 (which includes tax), we can visit any of the four main parks, Monday thru Friday, most of the year. Holidays, summer months, and the weekends are blocked out. And we can go to more than one park in a day. This year, we did stay at Disney’s Fort Wilderness Resort, which is both the nicest, and the most expensive campground we have stayed at. We paid $82.00 per night (plus tax) for a premier site. They do not offer any discounts, weekly or monthly rates. 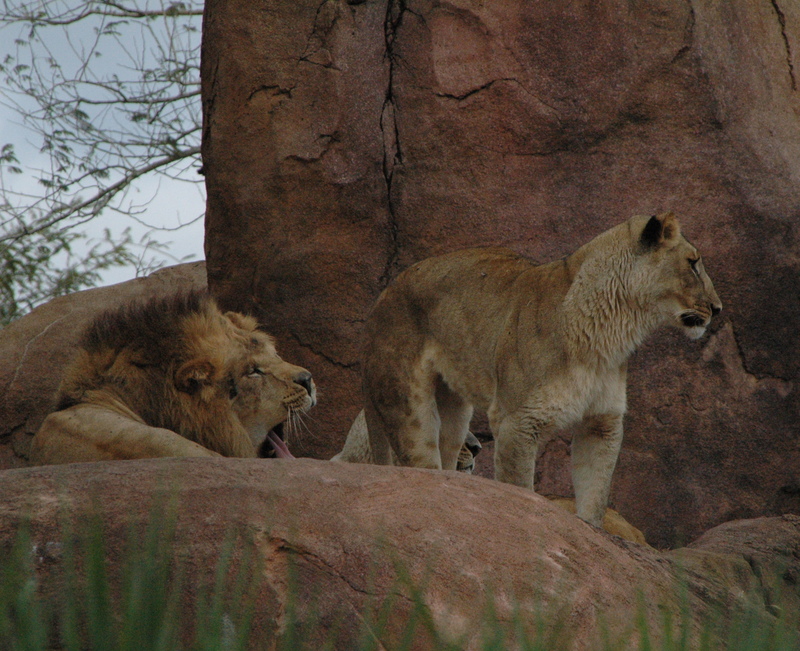 And their pricing varies depending on the season (we stayed during the cheaper “off-season”). 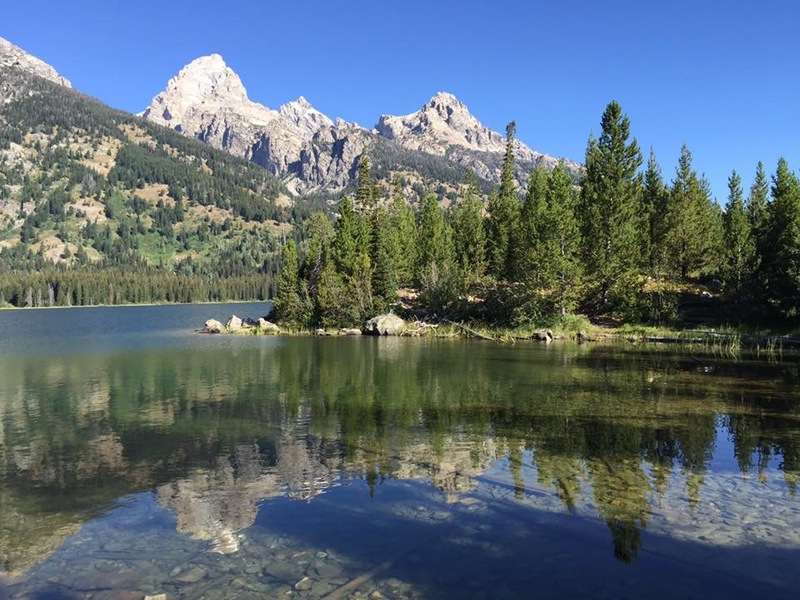 But they do allow up to 10 people per site, without an extra charge, and we did see a few sites that had both an RV and a tent (which is permitted), so if you come down with a few families, it is not a bad deal. And it does include a parking pass (which would cost $17.00 per day if not staying on the grounds). 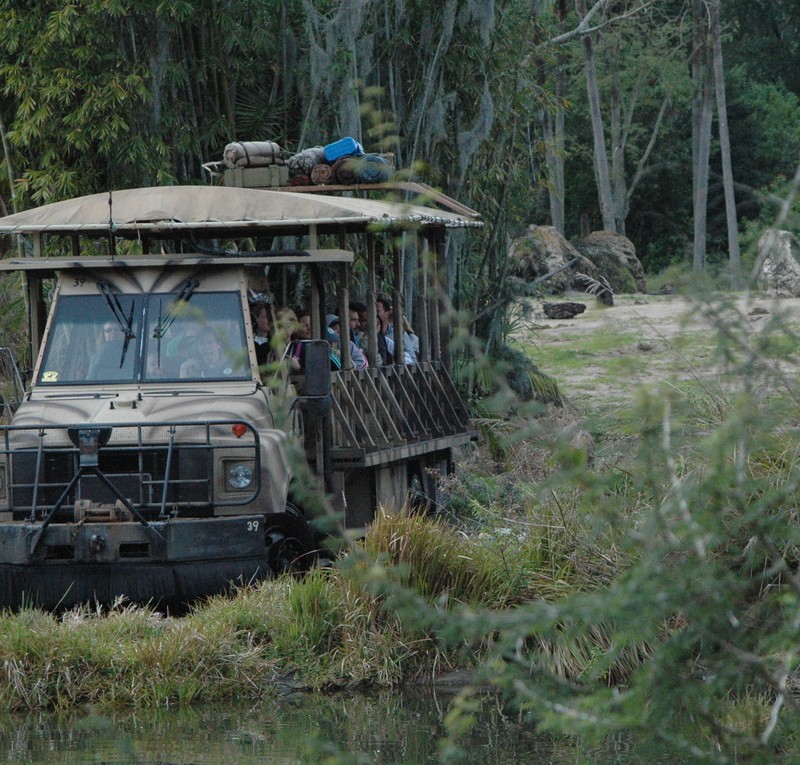 They also offer a boat shuttle to the Magic Kingdom, as well as a shuttle bus to all the other parks and Downtown Disney. We were able to link our reservations with Karen and Al, so we were all in the same loop (they have family and friends that also visit every year, and we joined in with the group). 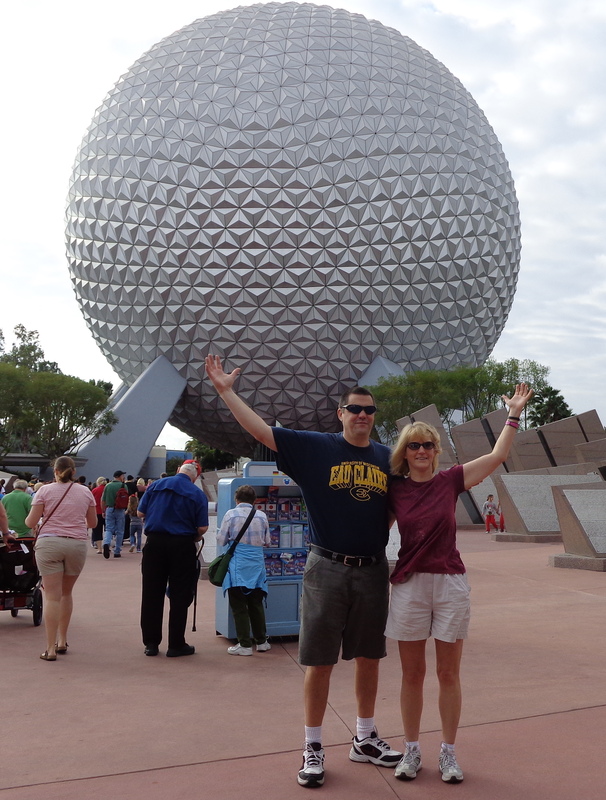 Our first day was spent back at Epcot, on a much more relaxed pace than last year, when we were trying to see and do as much as possible! When you stay at any Disney hotel, you will receive complimentary FastPass bands, which allow you to make advance reservations for up to three rides/attractions at each park. 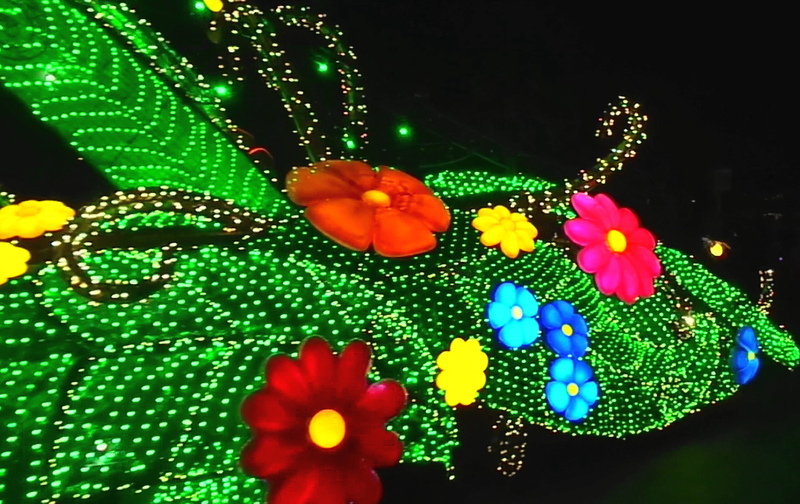 This will allow you to avoid long waiting lines on the more popular rides. Last year we did the ‘green’ option on the popular Mission Space ride, which simulates a rocket launch and spacecraft flight. This year, we opted to try the more intense ‘orange’ ride. 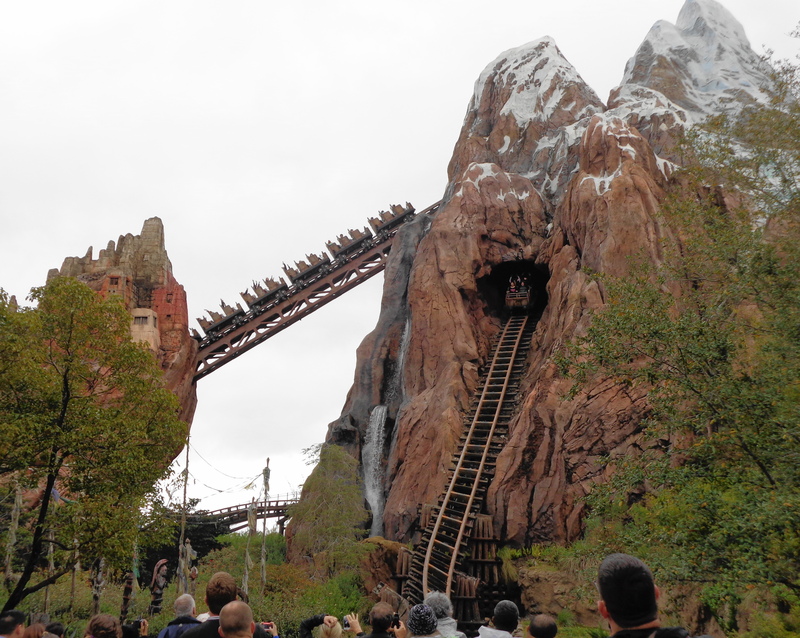 This one made my stomach a bit queasy, but it was not too bad, since we were familiar with the ride from last year. When it was over, I did notice several people getting off and sitting down right away on benches, holding the complimentary “space bag” that is on the ride. 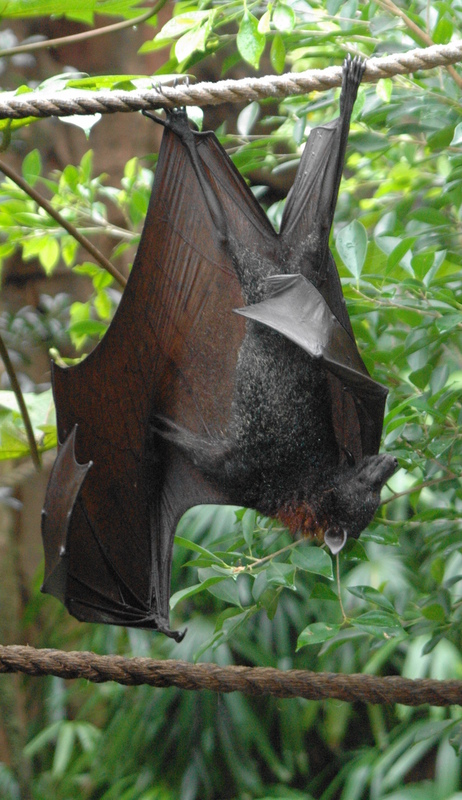 I would recommend not doing this ride right after eating! 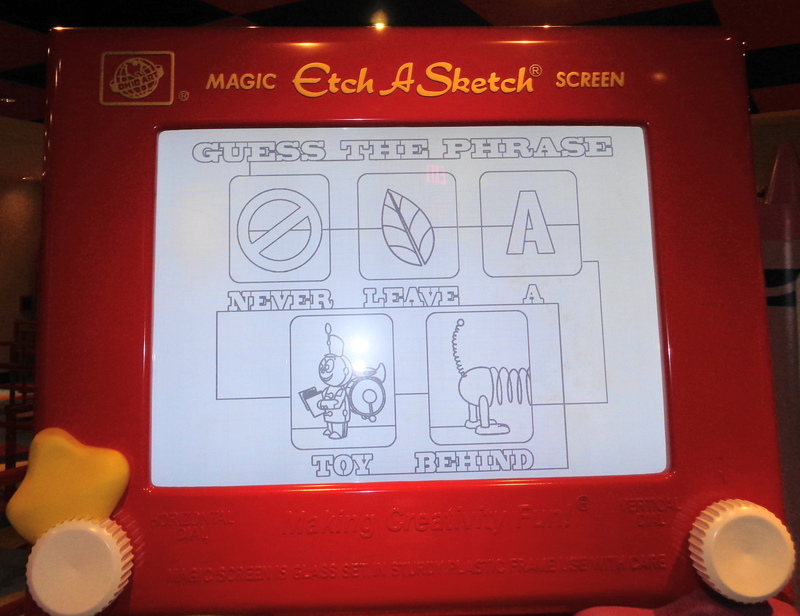 After that, we toured the Journey Into Imagination, with Figment, before our next FastPass, Turtle Talk with Crush. This was an interactive, animated story telling with Crush The Turtle that is geared towards children, but is fun for adults as well. 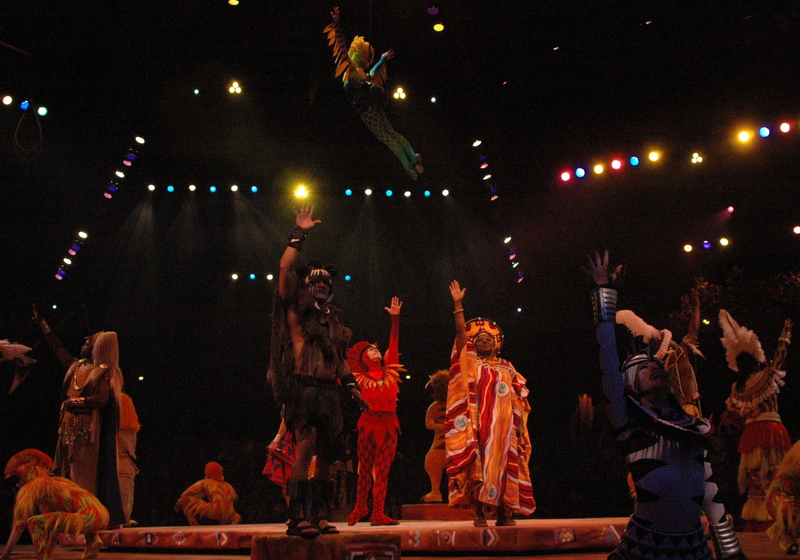 It appears that you are watching an animated movie, but the character does interact and talk with the audience. 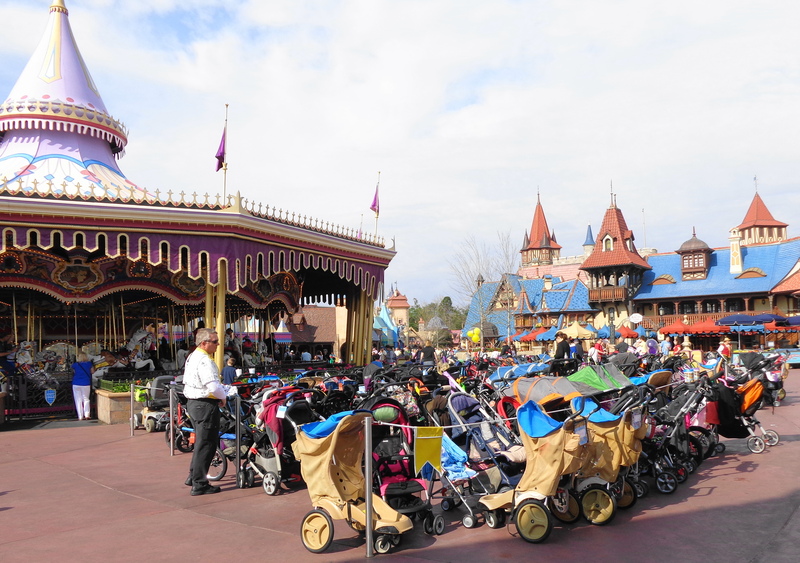 You can tell when you are close to more kid friendly attractions, when you run into the designated stroller parking areas! Dan and I originally set up our FastPass to include Captain EO, but Al stated there is never a long wait for this, so we did not have to waste one of our three options on this. Captain EO was originally made for Disney in 1986, and was discontinued several years ago. But after the death of Michael Jackson, Disney brought back this 18 minute 3D film. It was interesting to see how much 3D technology has changed since this was made. What was state of the art back then, just seems a little ‘ho hum’ now. 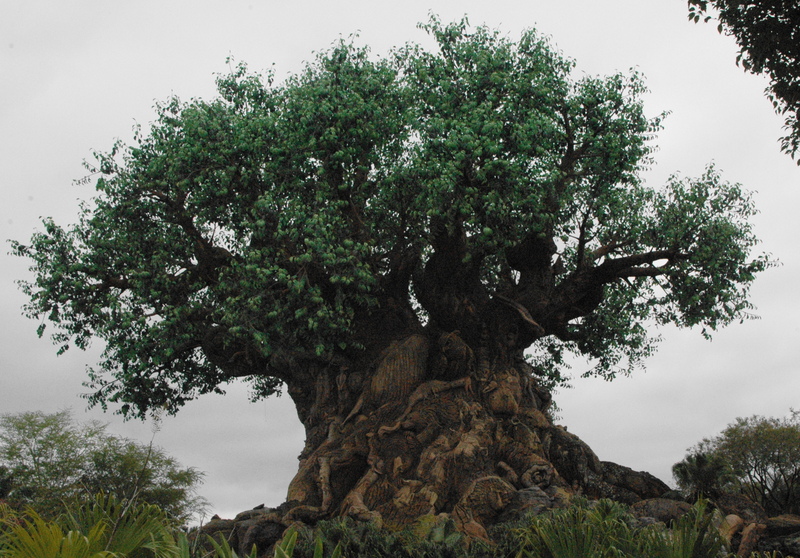 With the FastPass option at Epcot, Disney only let’s you select one of the two biggest rides. You can choose either Soaring, or Test Track, but not both. 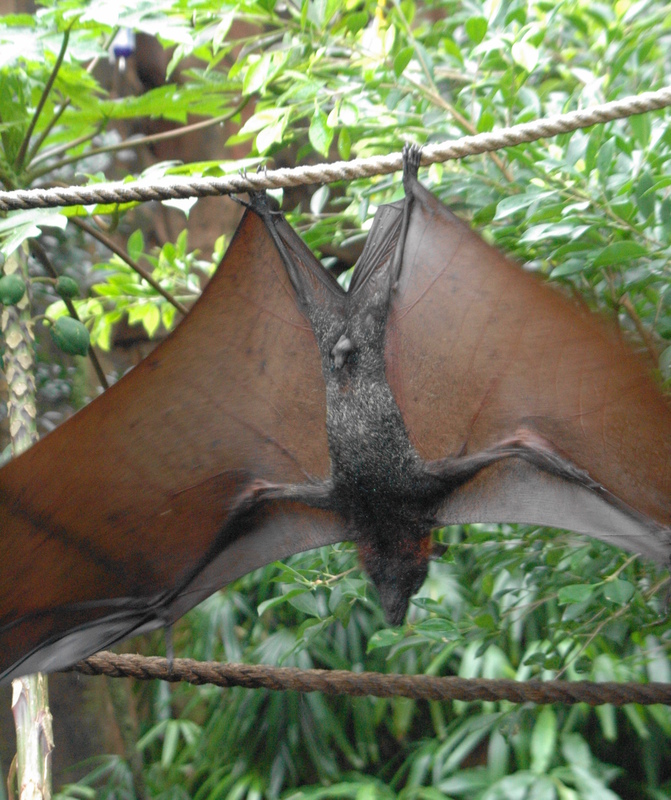 Last year we went on Soaring, which was excellent. 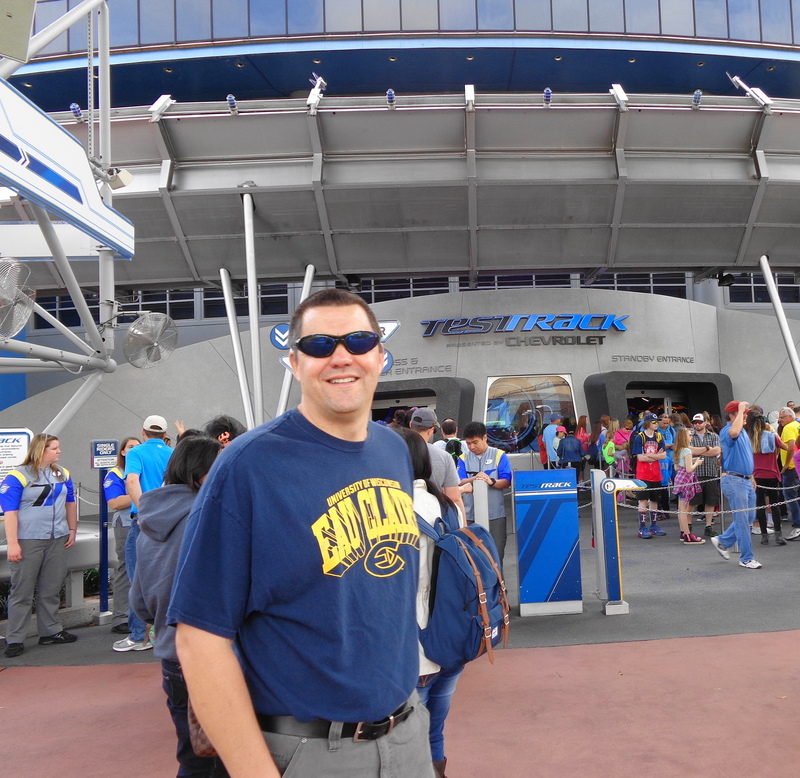 This year we opted for Test Track, which was also a lot of fun. You design a car, and then take it for a ride along a test track to see how it performs on turns, speed and under adverse conditions. Both would be great choices, and both have long ‘stand by’ wait times. Your best bet would be to get to the park right away and stand in one of the lines, and have a FastPass for the other later in the day. All these rides made us hungry, so we headed over to the World Showcase portion of Epcot for a late lunch. Al had made reservations in Italy, at Via Napoli Ristorante e Pizzeria, where we sampled several different wood-fired pizzas. We then headed over to France, for some excellent desert at Les Halles Boulangerie & Patisserie. We stopped there last year, and it was so good, and reasonably priced, that I wanted to stop there again this year. We burned a few calories walking around the rest of the world, and then headed back to the campground to let the dogs out. 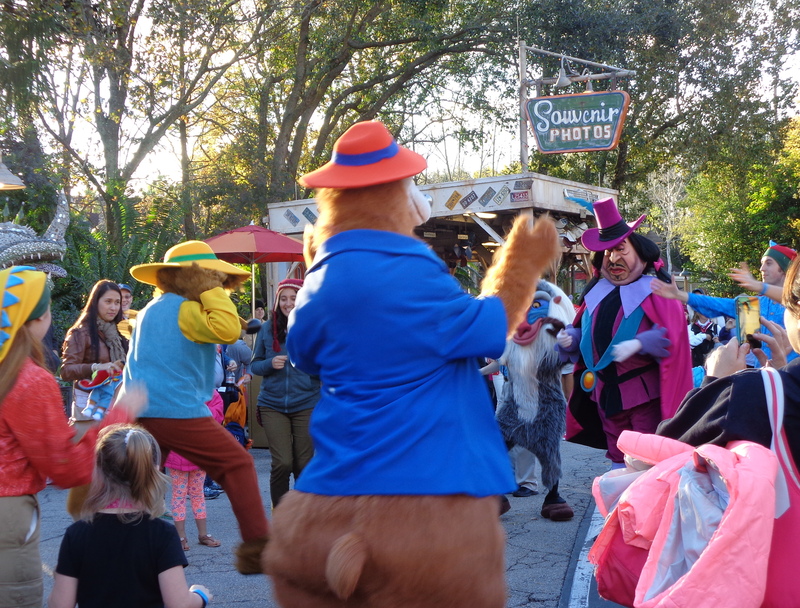 Since I took so many pictures last year at Epcot, I do not have a lot of photos from Epcot this year, but I did manage on finding a few more characters. This year I did a little better in guessing who they were! 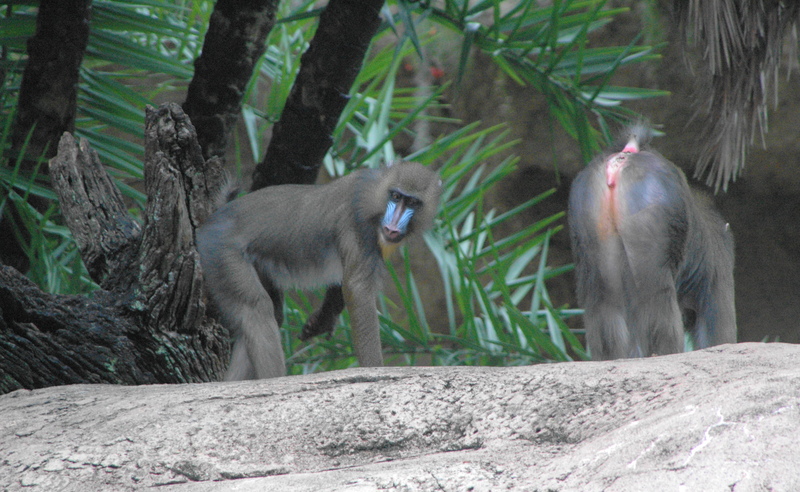 Do you know how to tell these two apart? 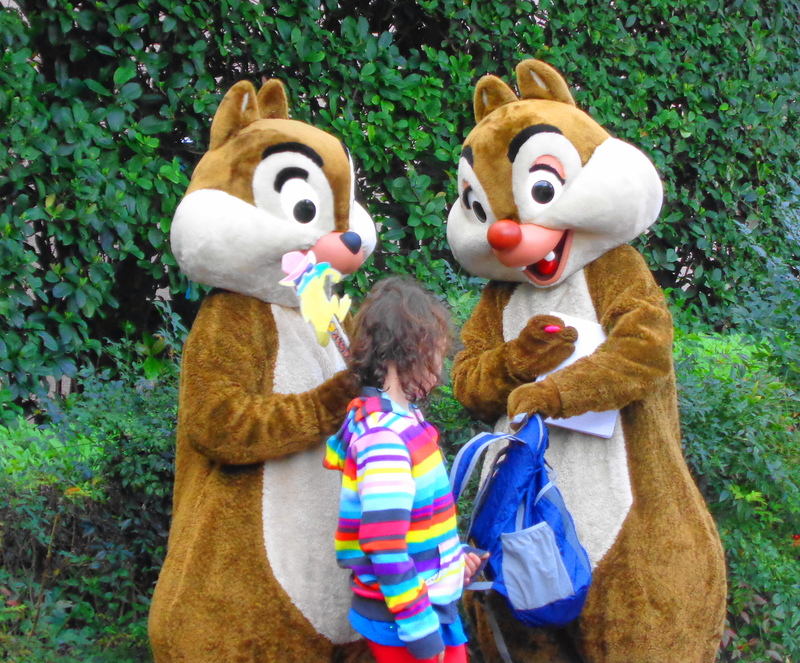 Chip has a brown nose, and Dale has the red one. Learned something new at Epcot! 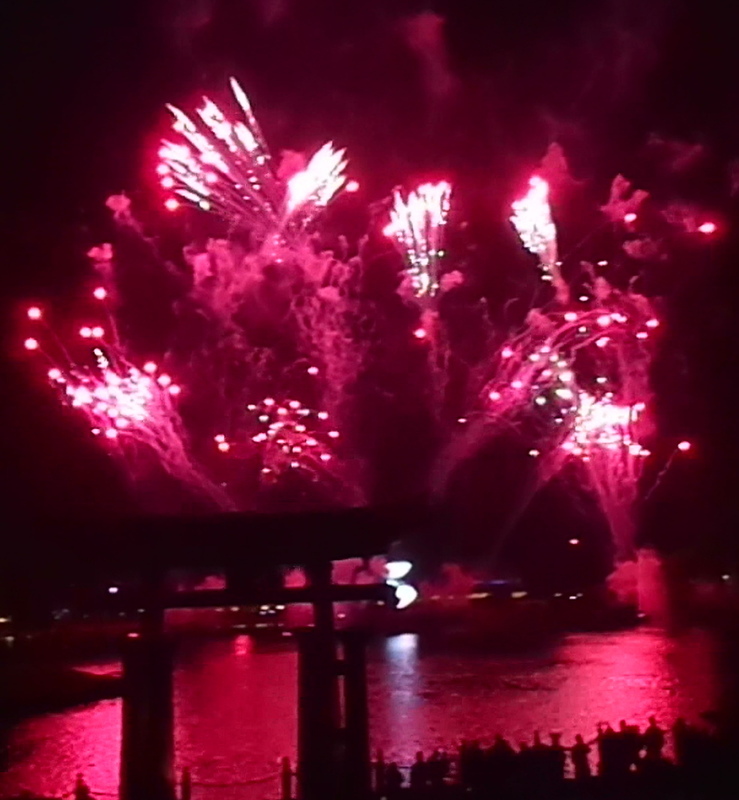 After feeding Makena, Dan and I took the free shuttle boat ride from our campground to the Magic Kingdom, to watch the evening parade and fireworks. Since this blog is already pretty long, and I took a lot of photos in the evening, that will be the topic of my next blog.